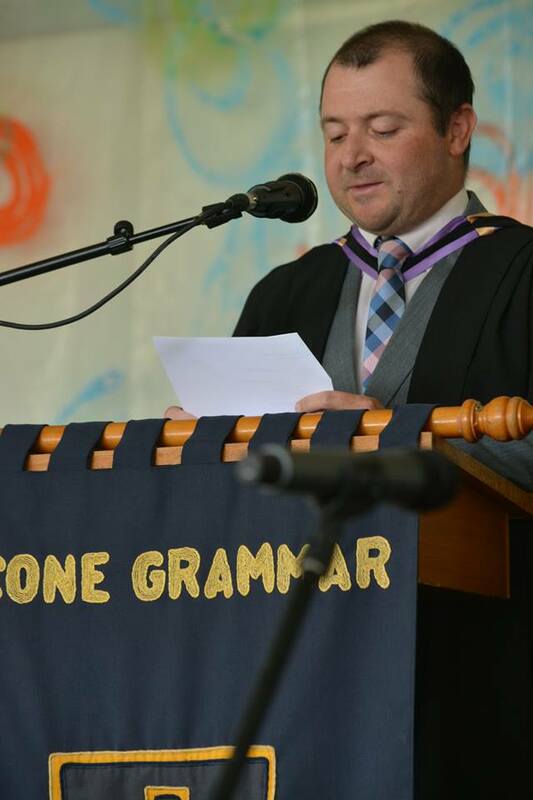 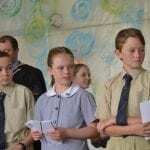 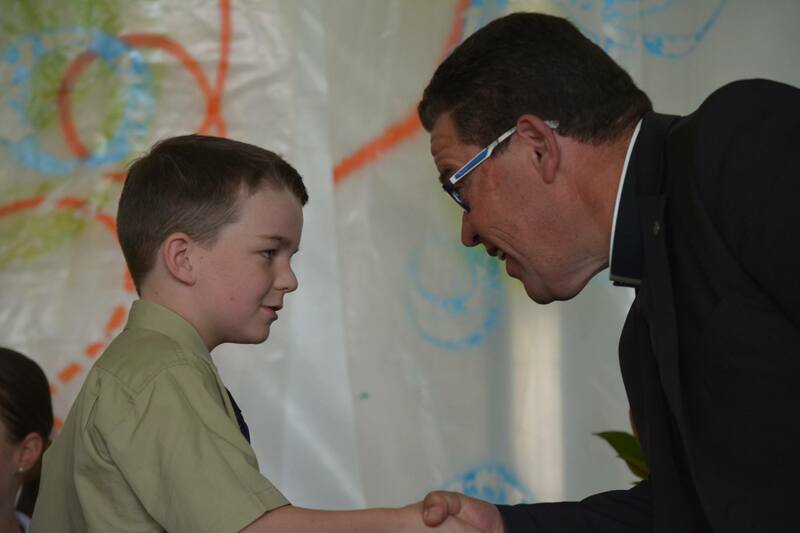 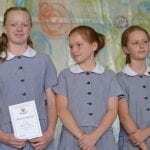 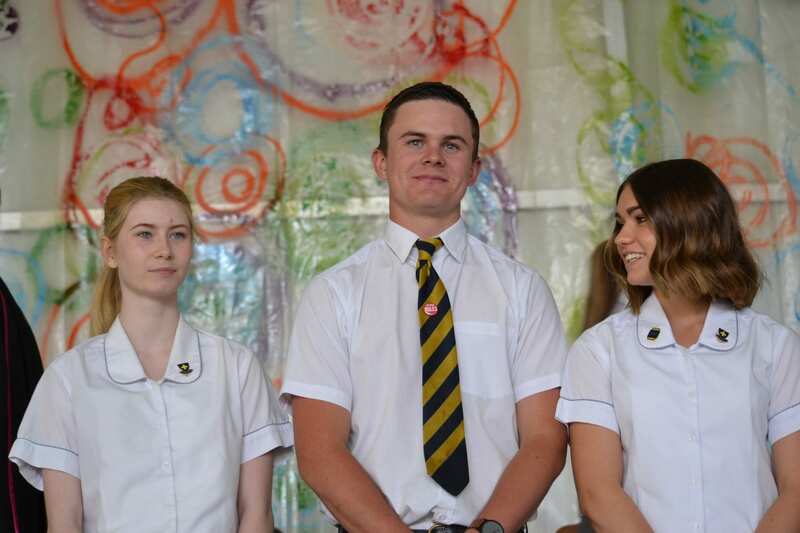 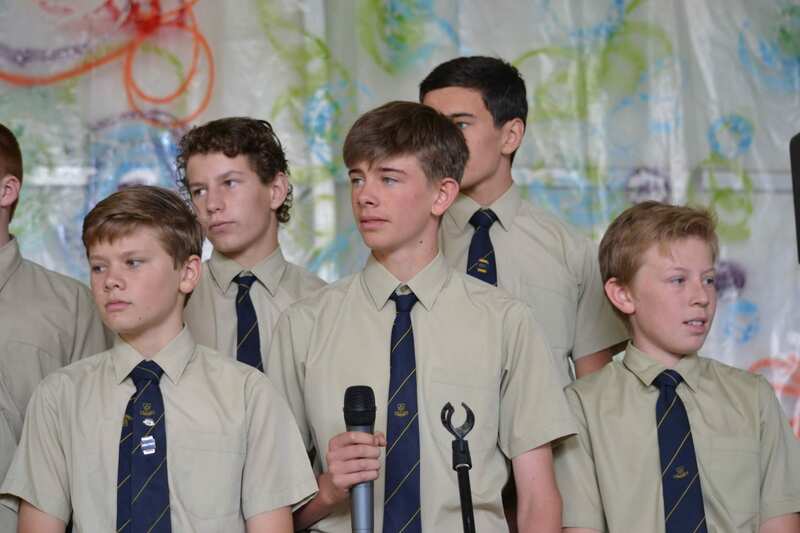 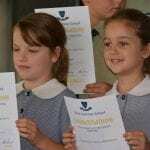 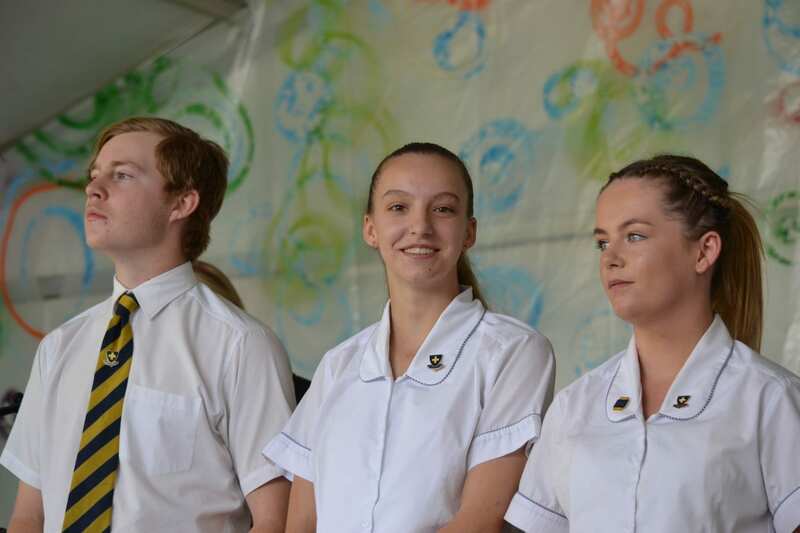 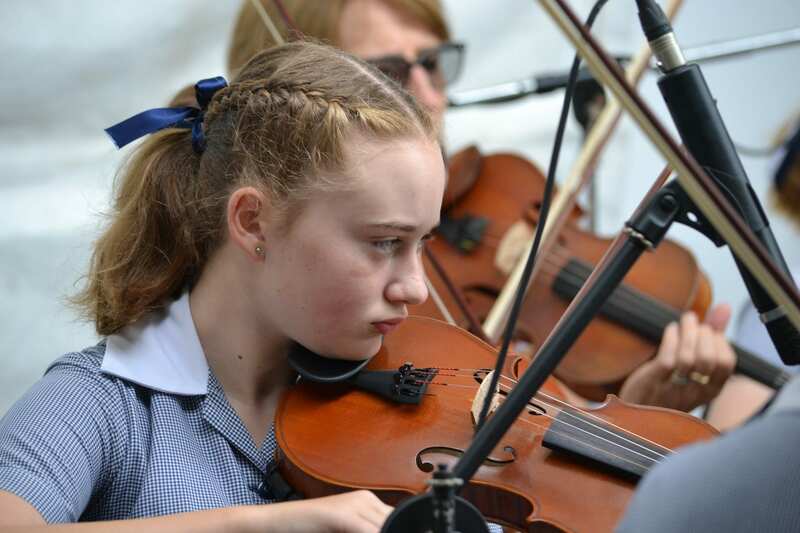 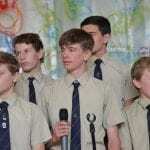 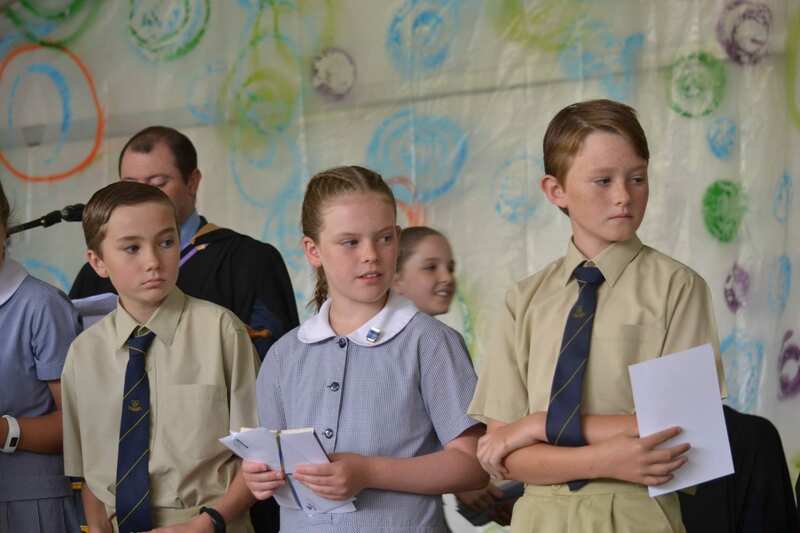 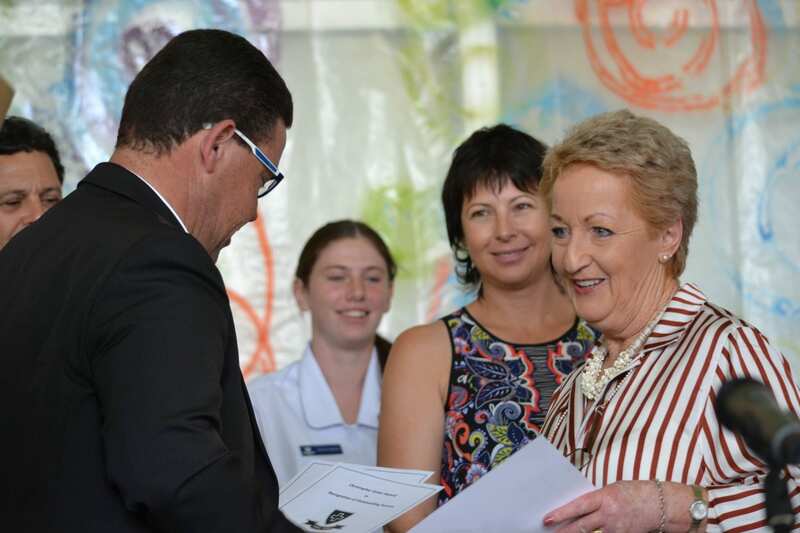 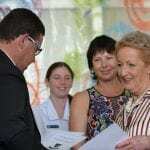 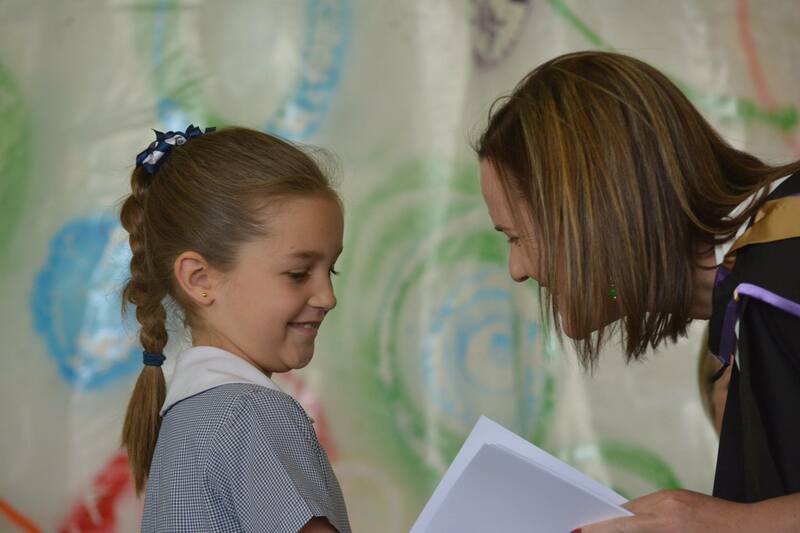 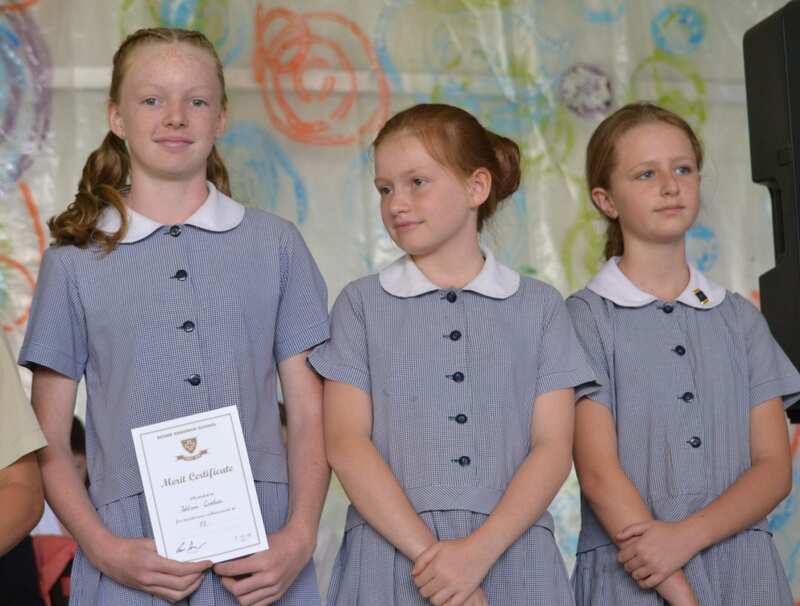 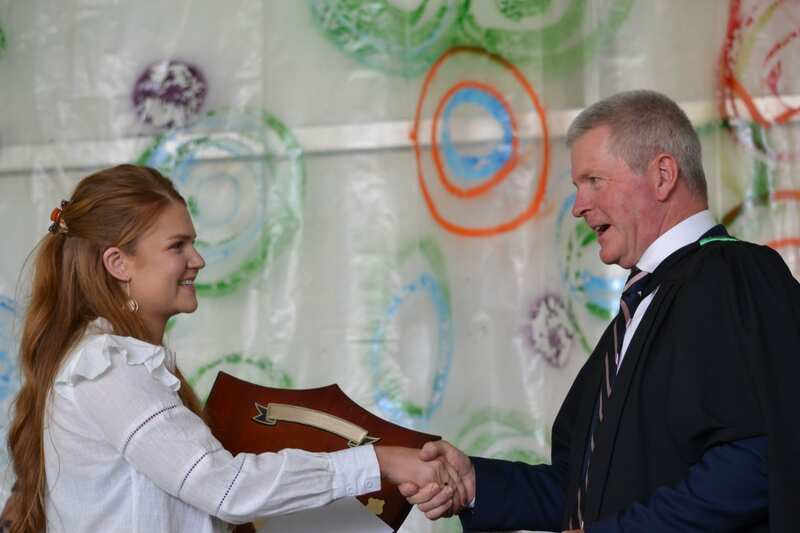 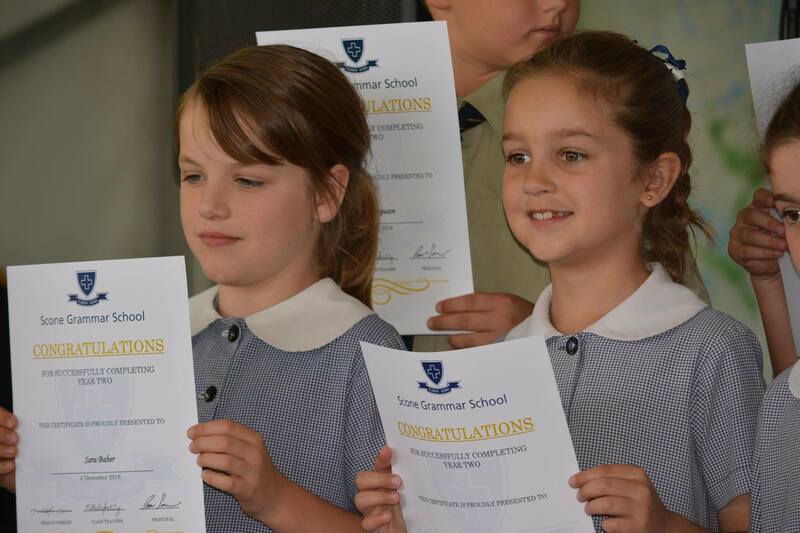 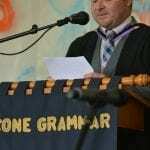 The Scone Grammar School community gathered on Wednesday for their annual Speech and Presentation Day, marking another year of success both inside and outside the classroom. 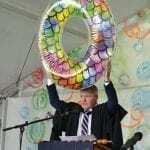 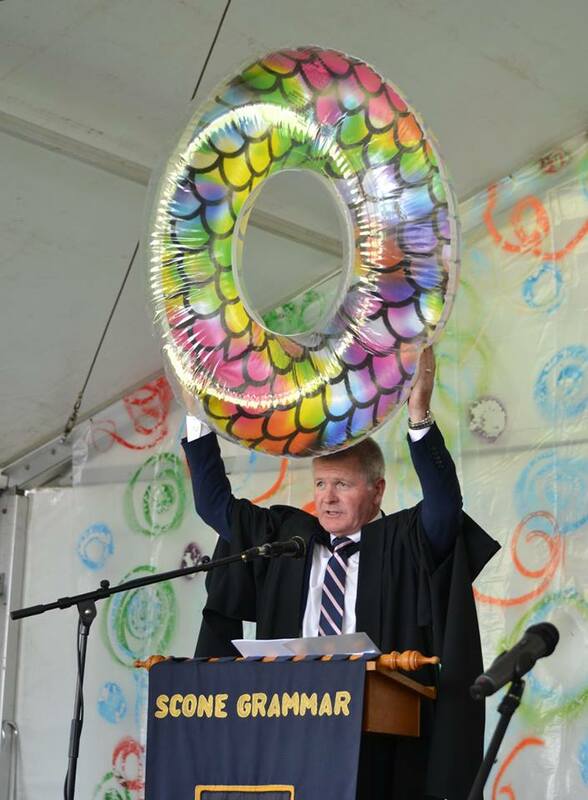 A year of celebrating amazing achievements on so many levels for students and staff, all along, embracing the 2018 motto ‘Watch the donut, not the hole’. 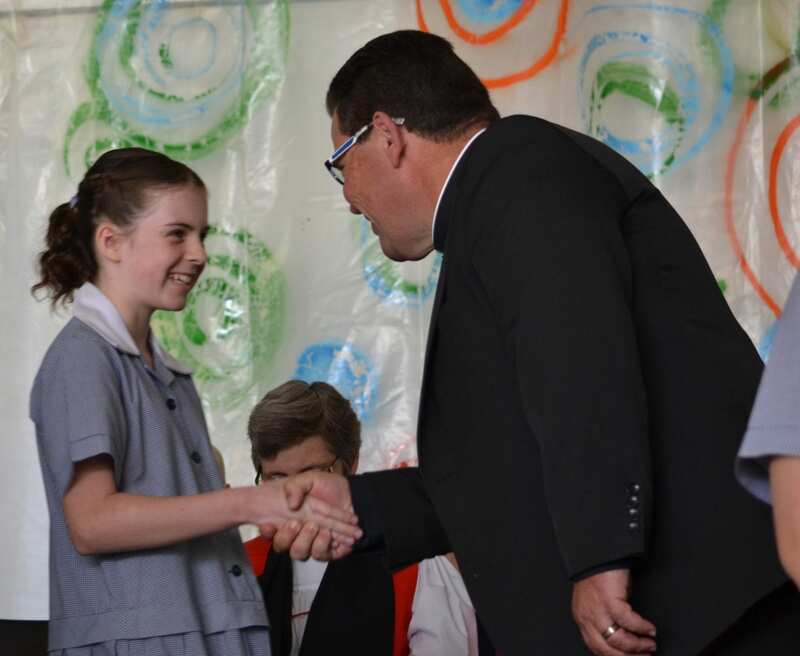 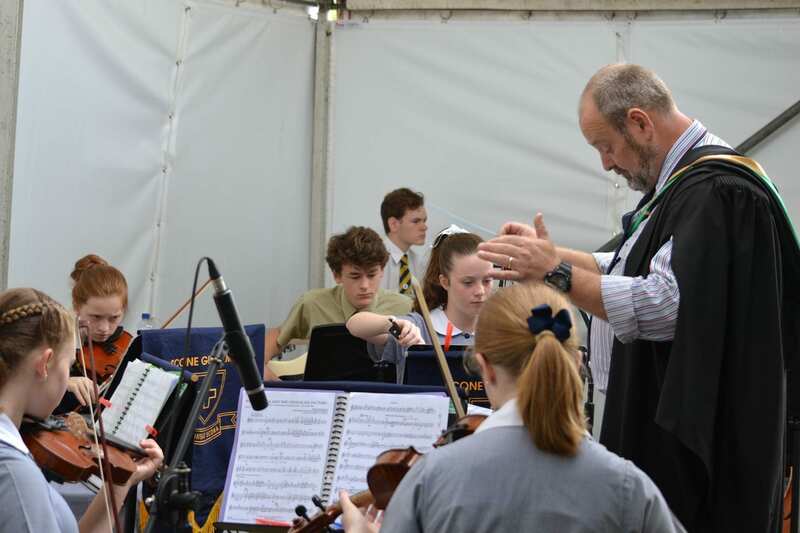 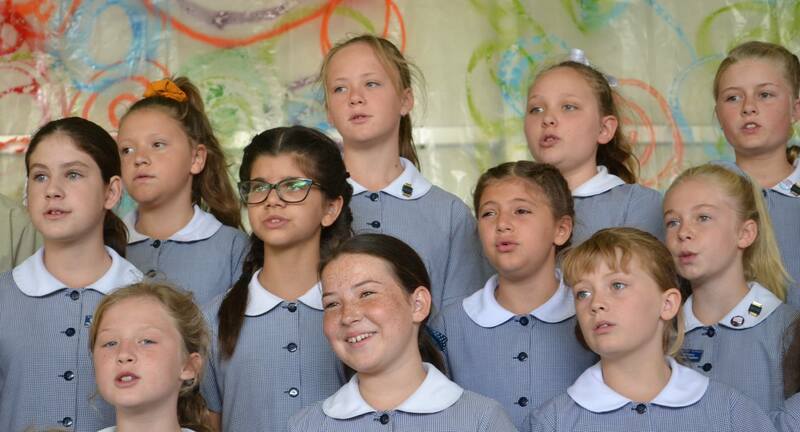 Merit certificates and special prizes were presented to students from Years 3 to 12 while the stage was brought to life by a number of musical performances including the Senior Choir and Voiceworx. 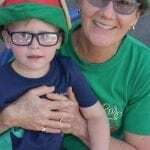 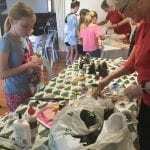 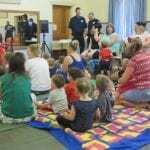 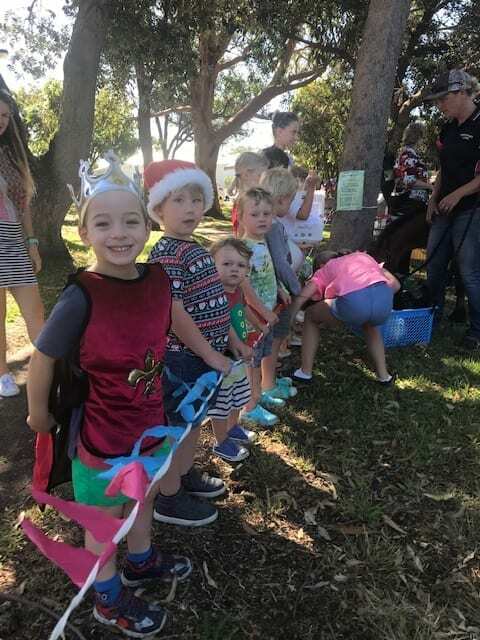 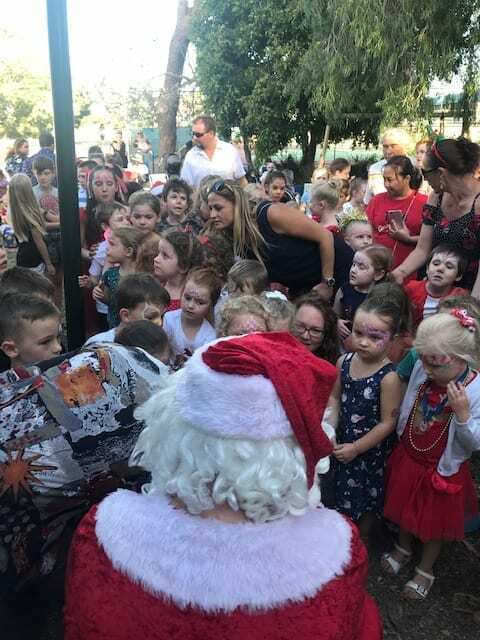 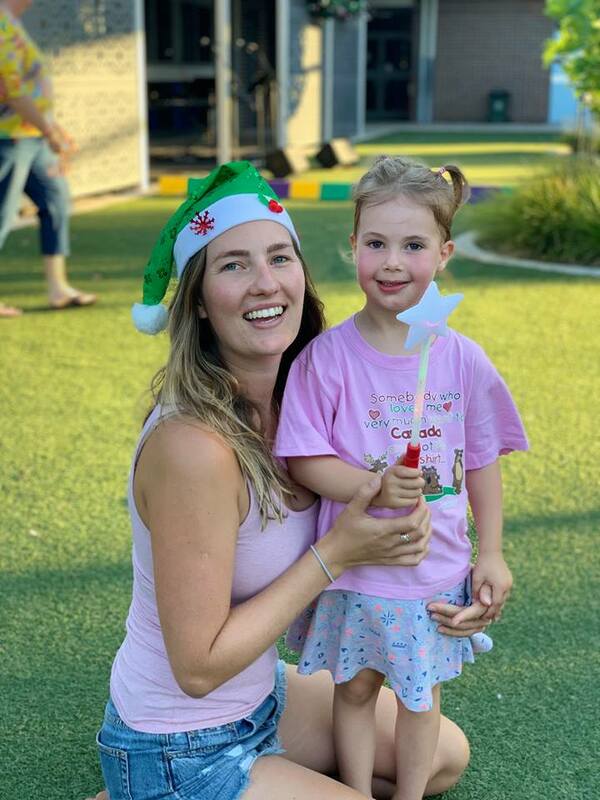 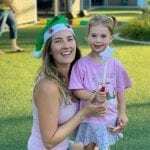 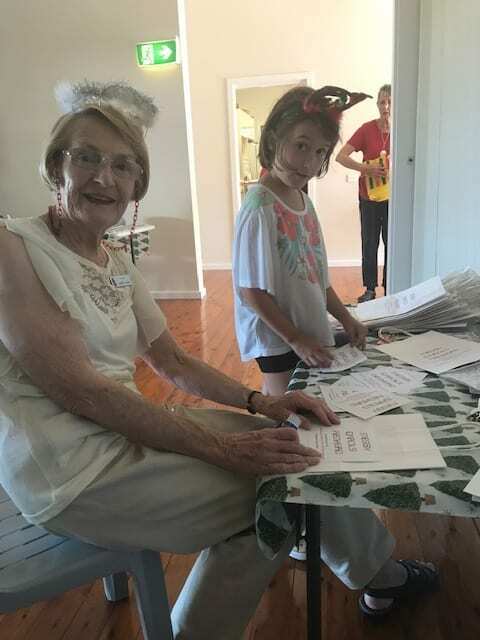 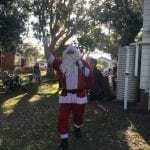 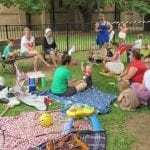 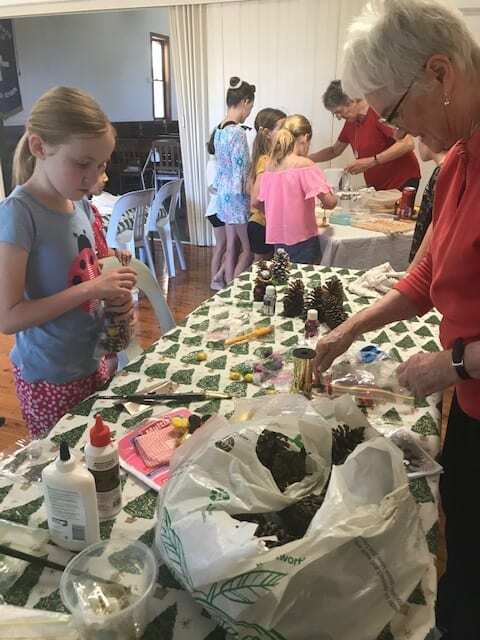 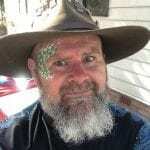 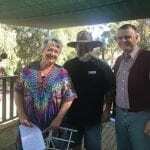 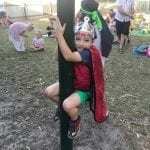 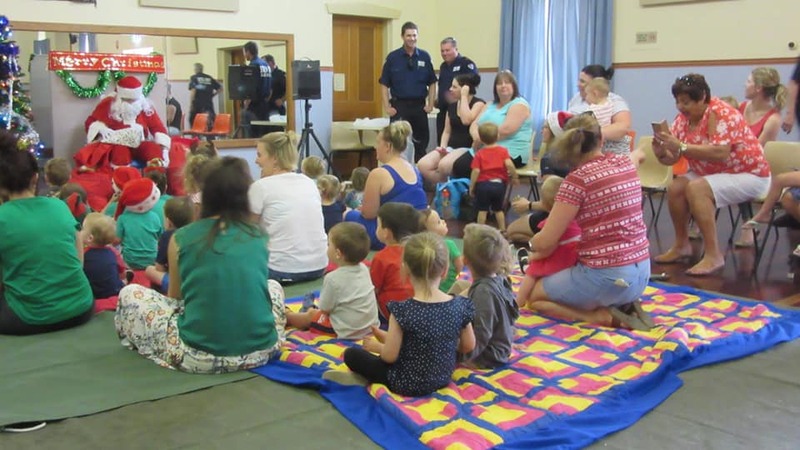 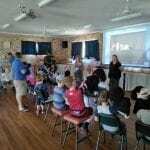 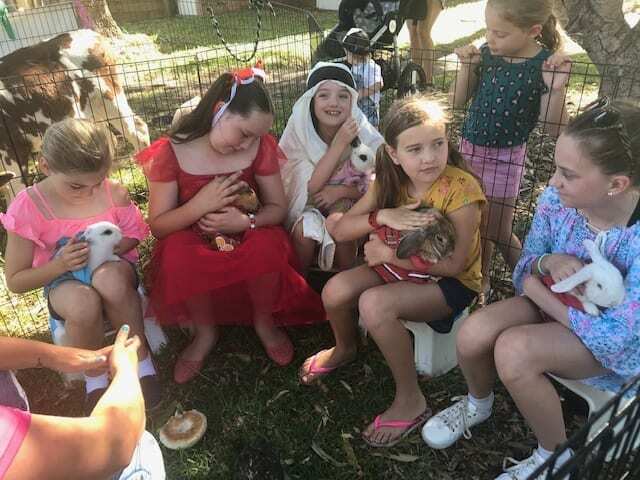 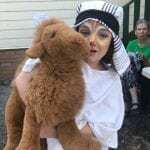 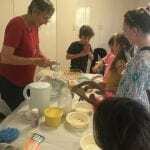 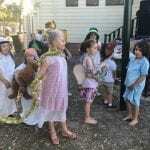 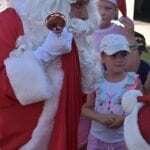 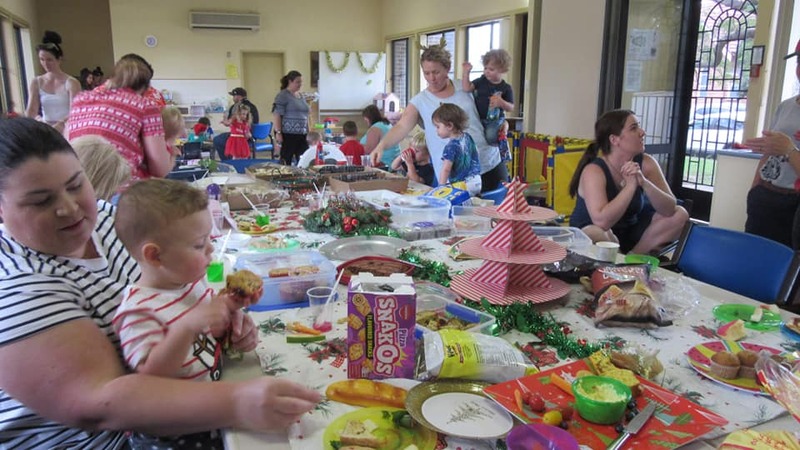 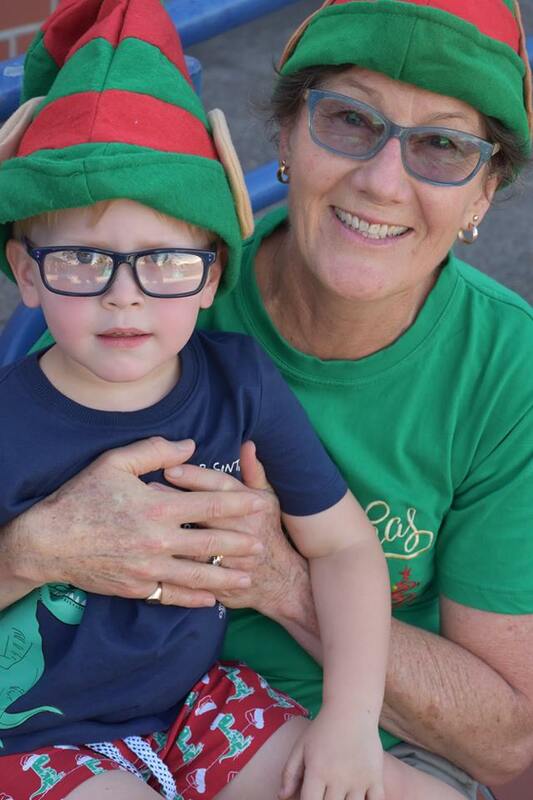 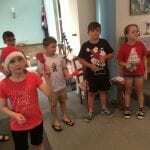 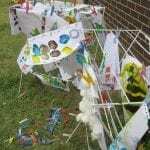 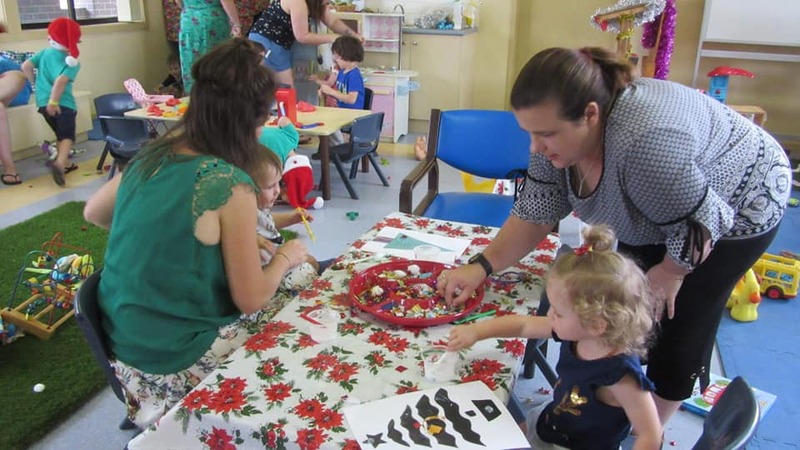 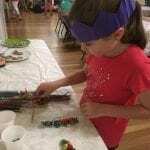 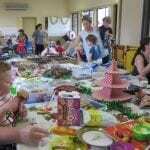 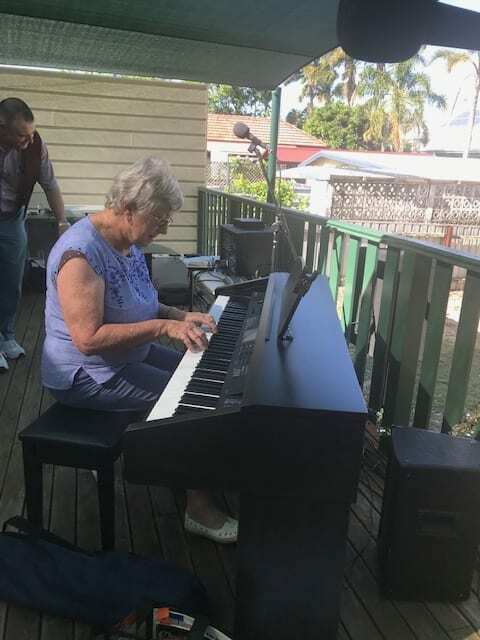 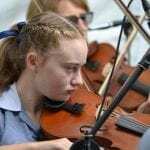 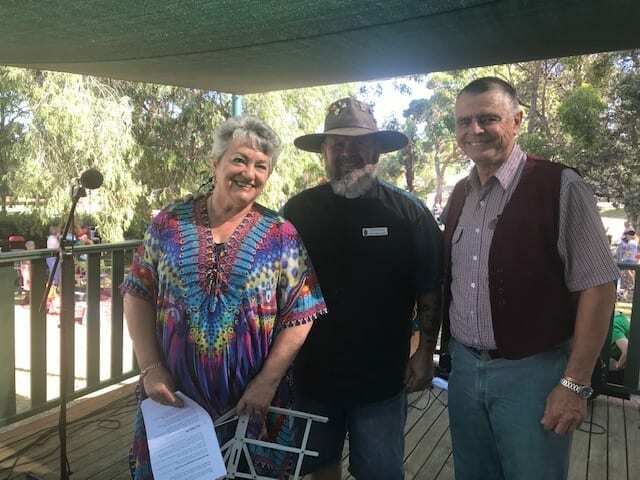 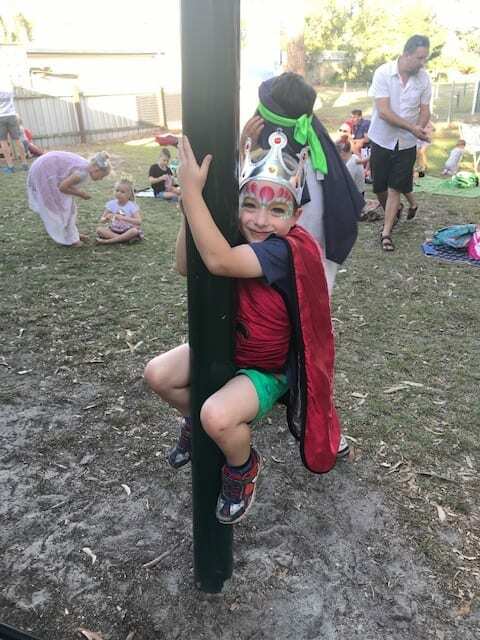 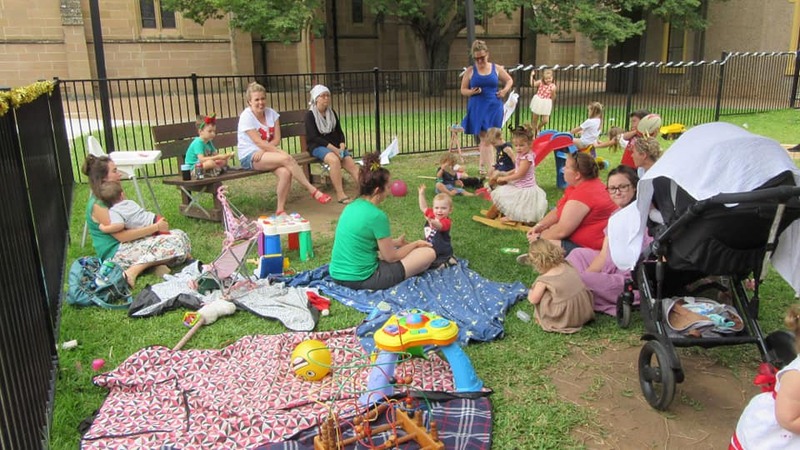 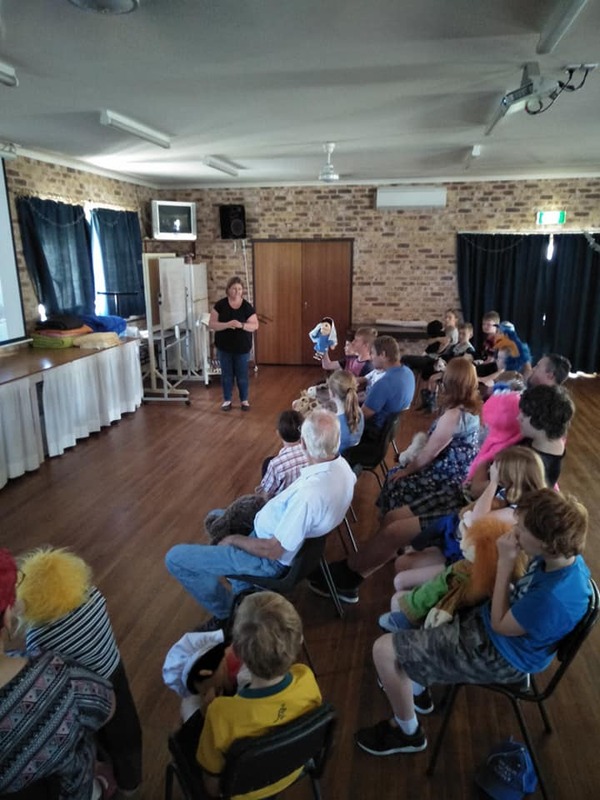 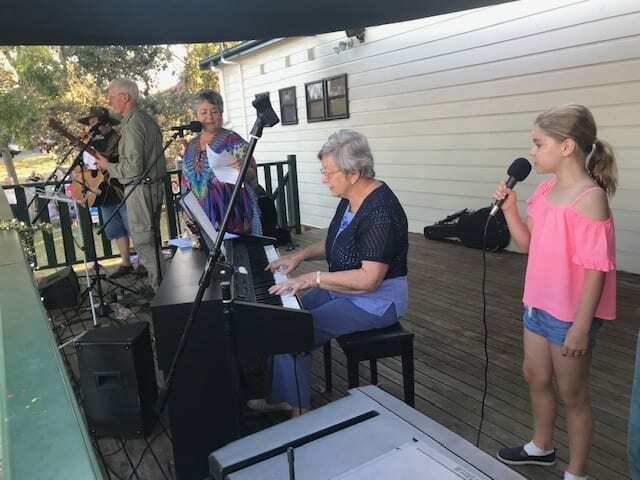 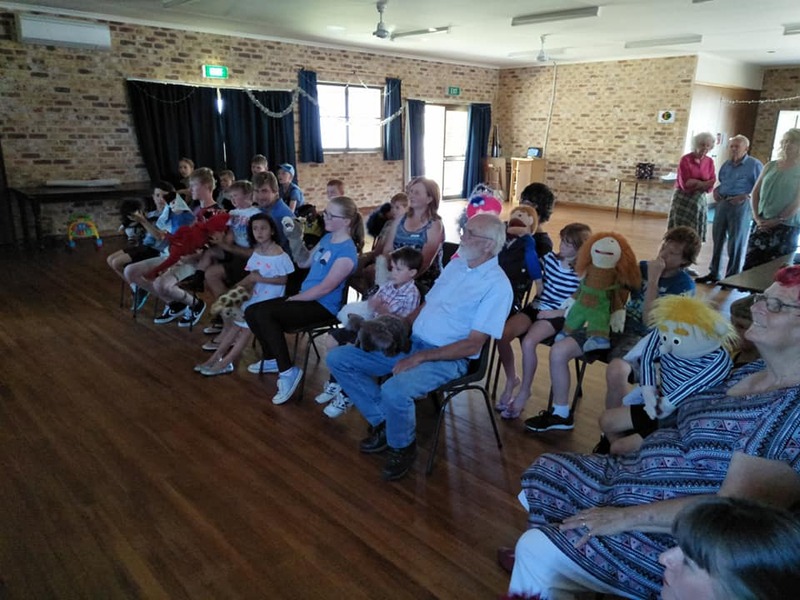 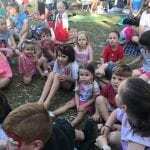 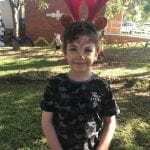 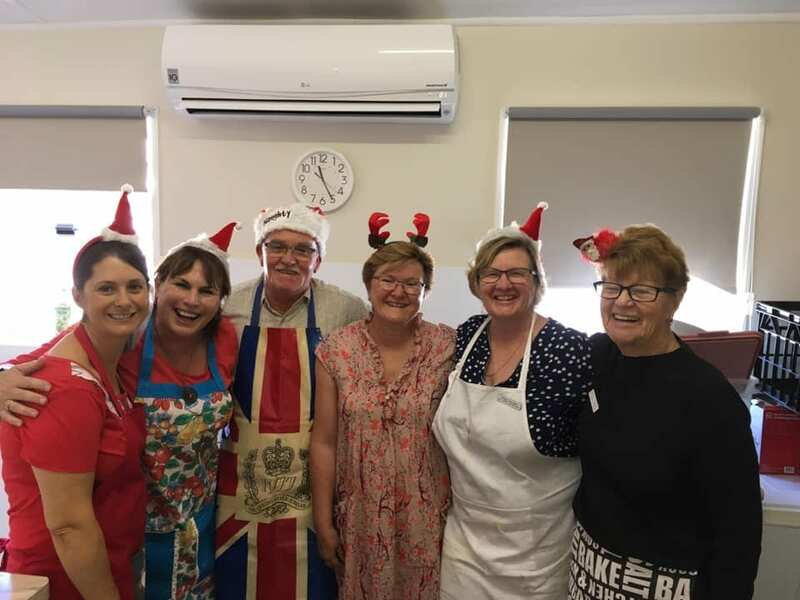 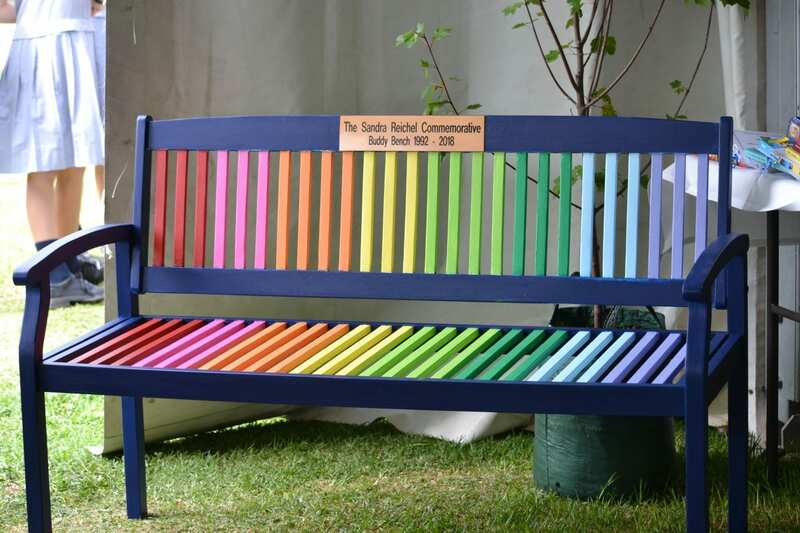 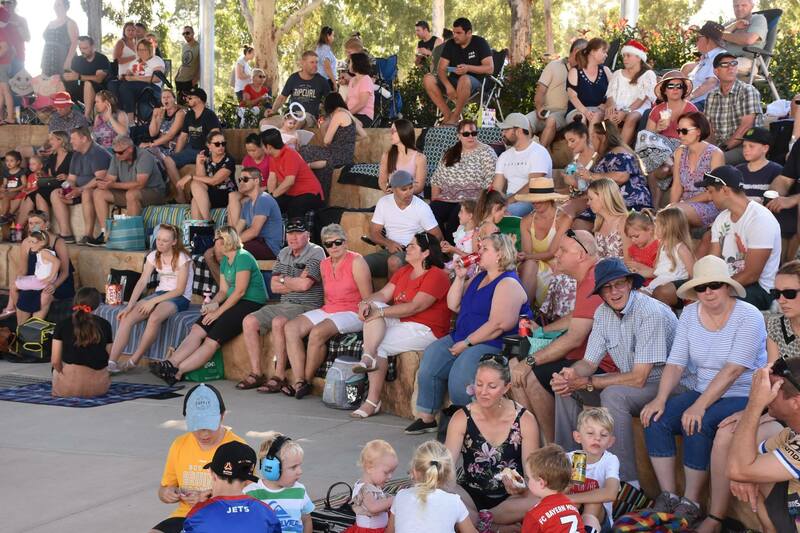 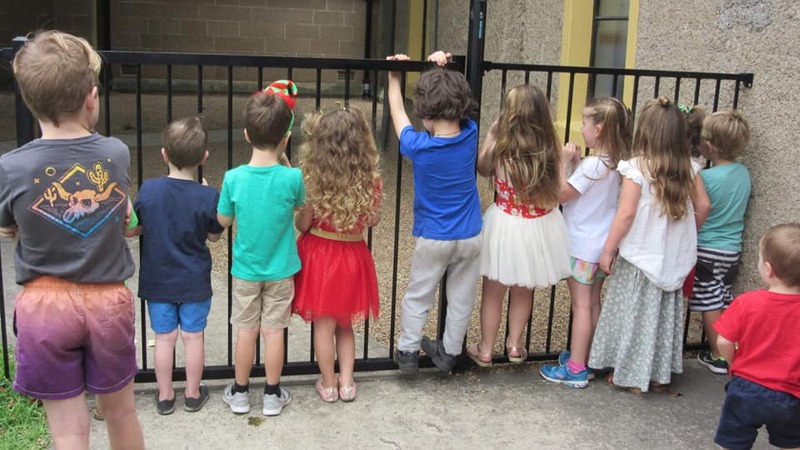 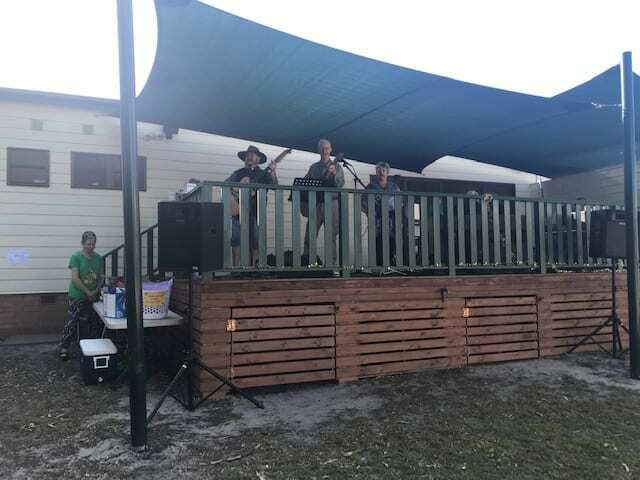 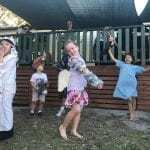 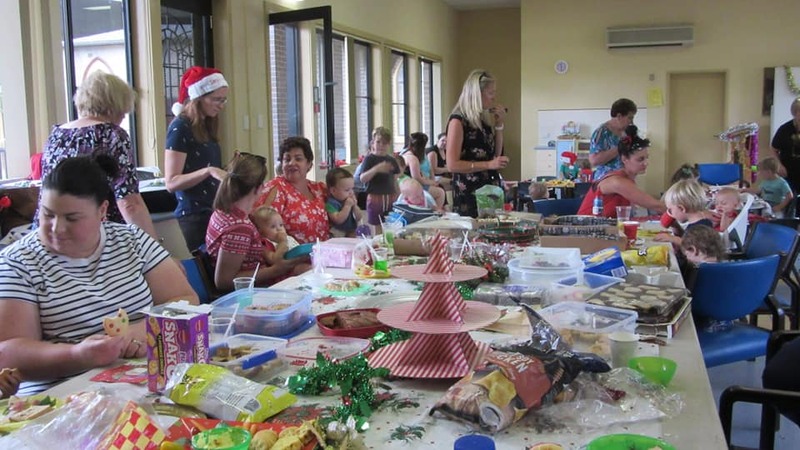 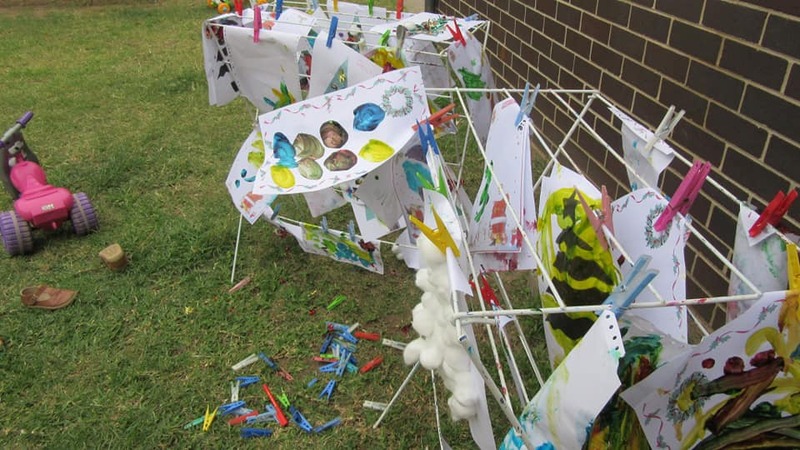 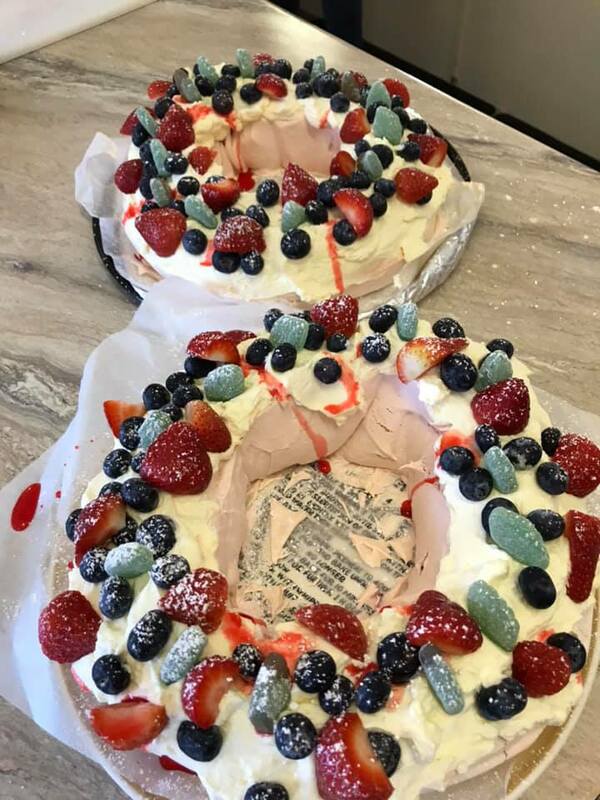 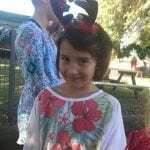 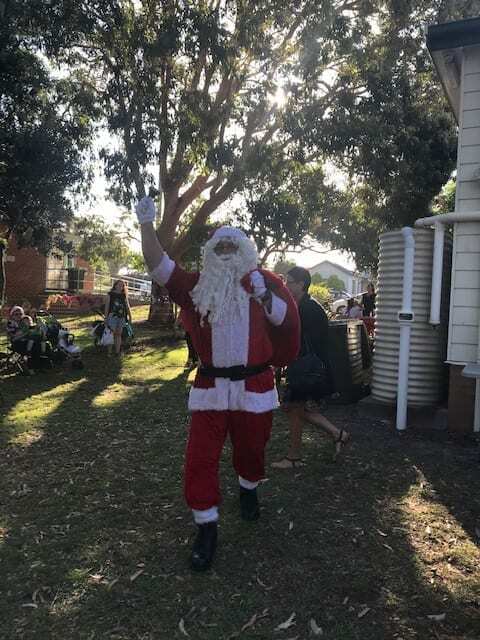 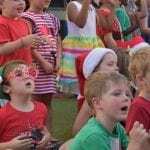 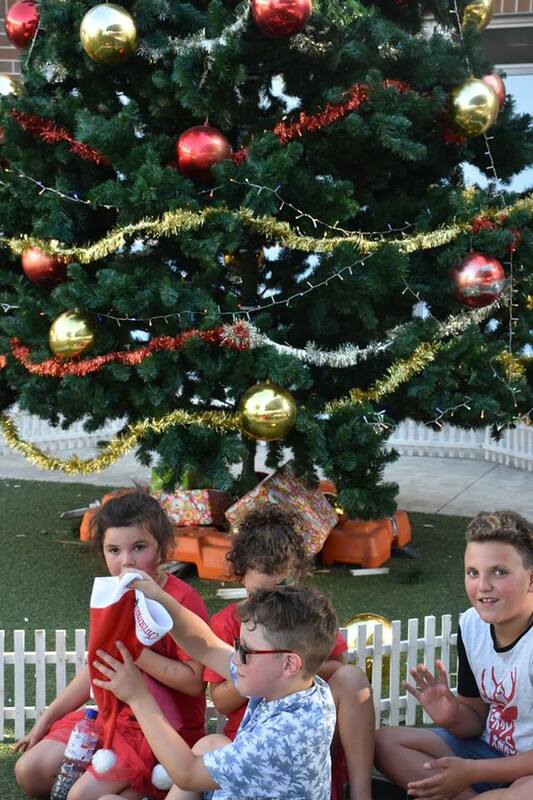 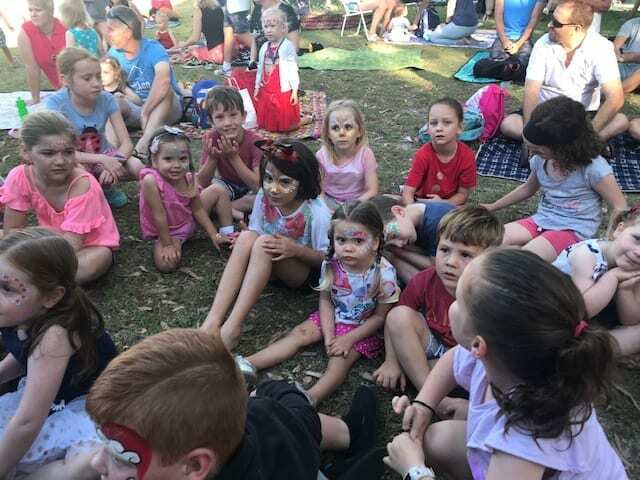 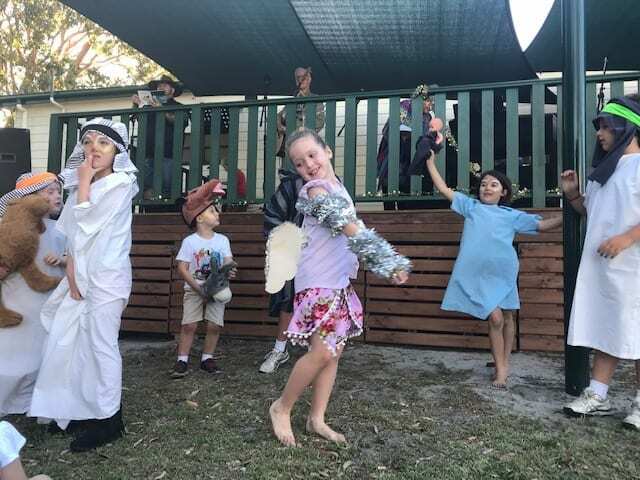 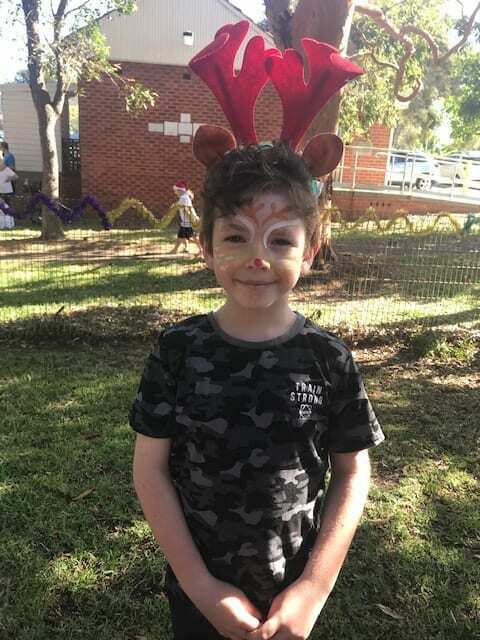 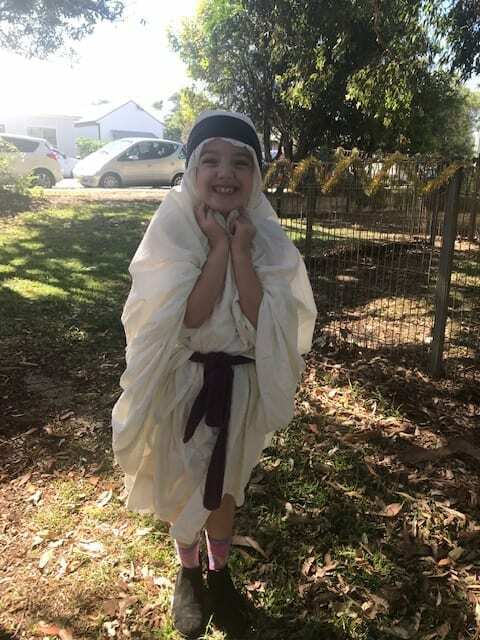 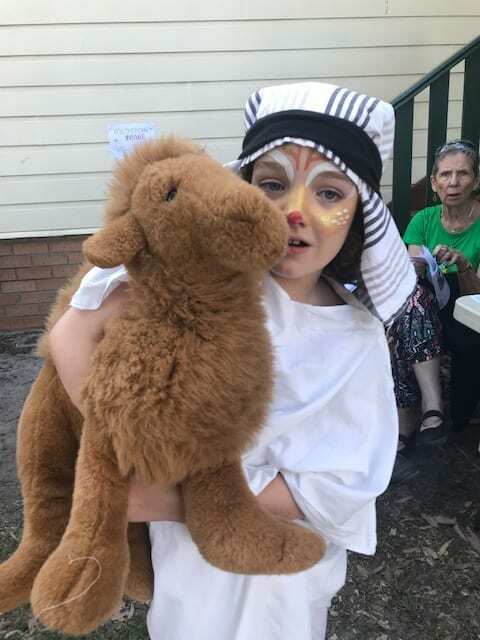 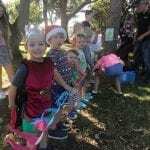 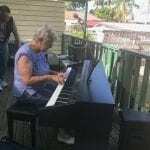 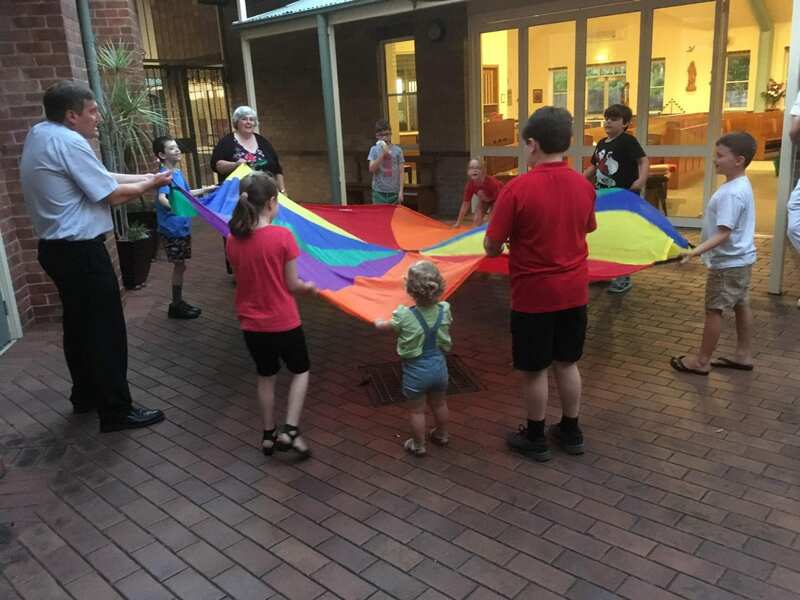 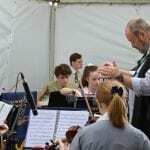 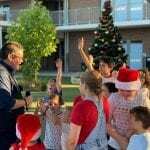 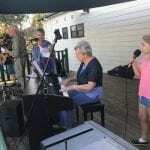 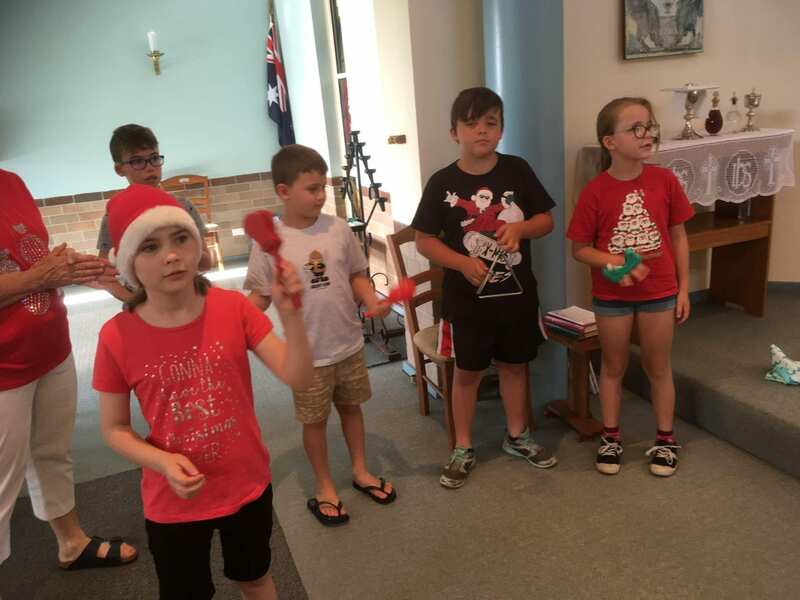 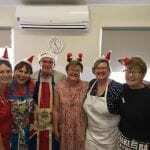 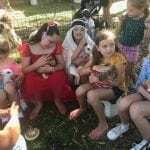 On Saturday BNR Anglican, with Charlestown and Belmont held their annual A Very Messy Christmas Carols in the grounds and surrounds of Redhead ministry centre. 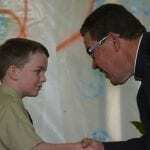 Each parish took responsibility for different aspects of the event. 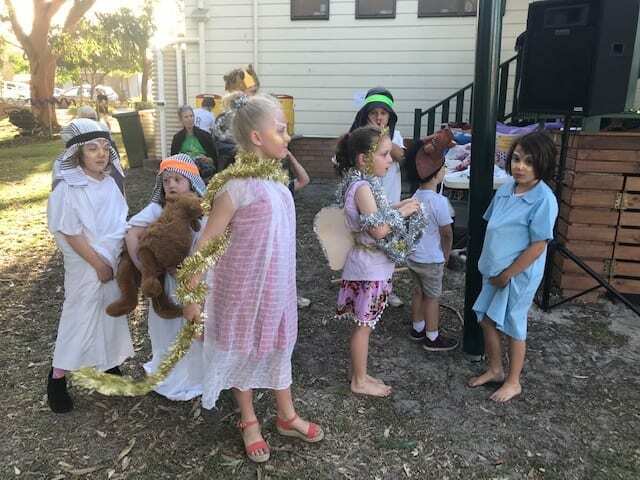 Working together like this resulted in a highly successful night of song, poetry (the nativity was told in poem form thanks to The Bible Society’s Christmas booklet), food and craft. 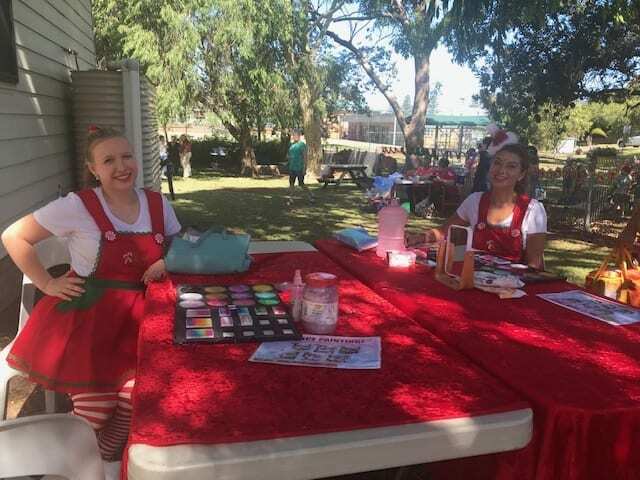 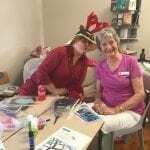 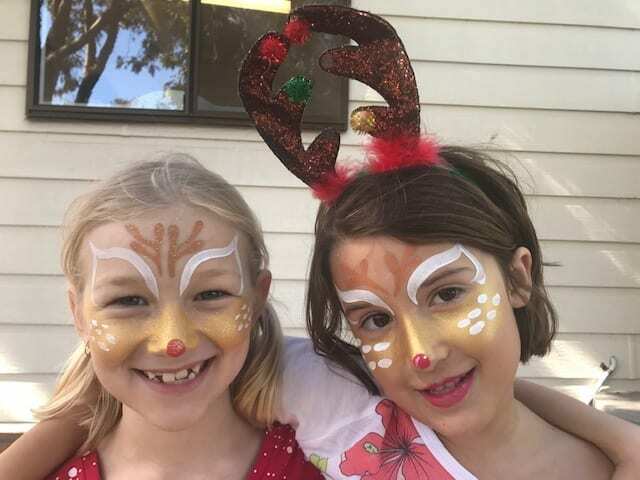 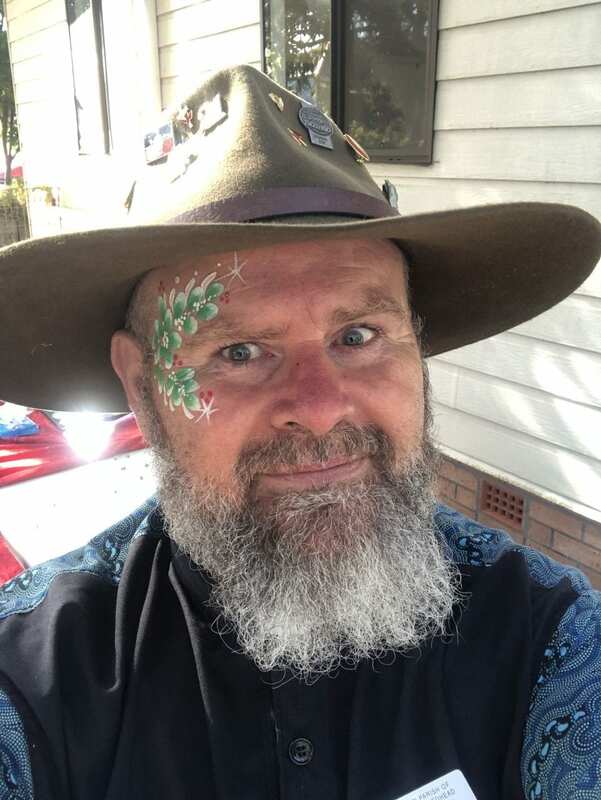 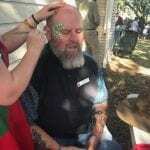 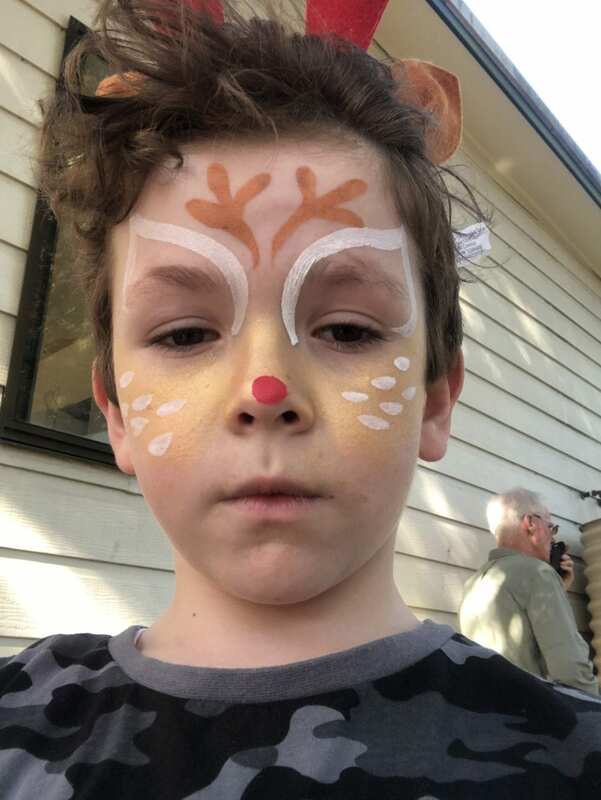 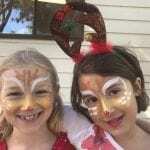 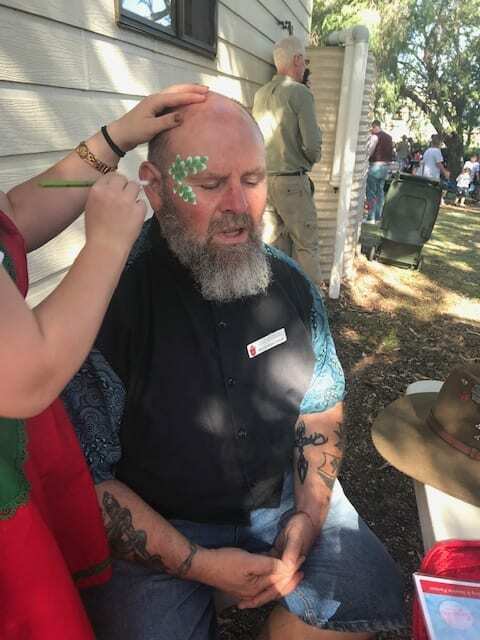 From 4pm until 7pm parishioners and community members were able to get their faces painted, ride on ponies, enjoy bbq’d sausages and sing along to most of our well known and beloved Carols. 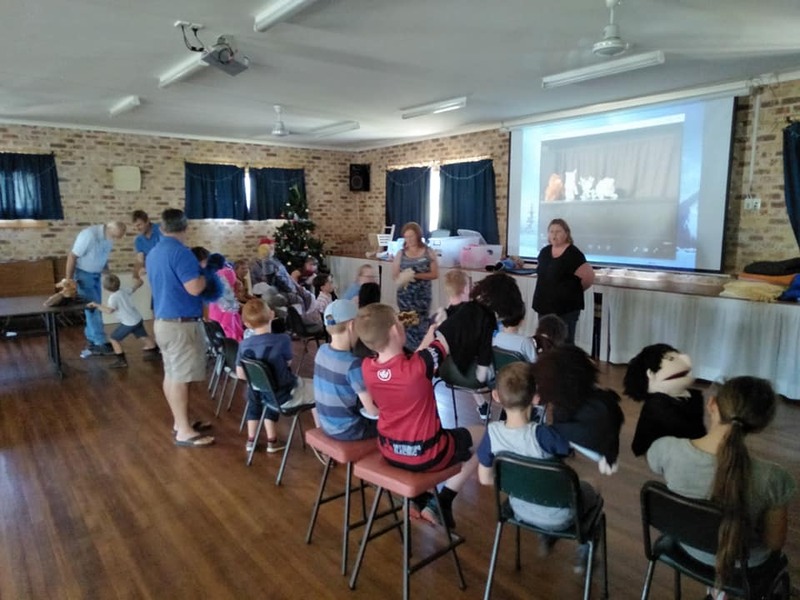 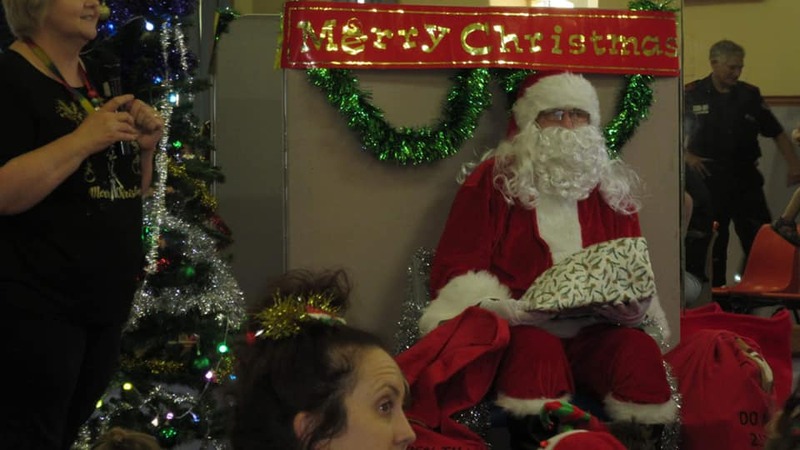 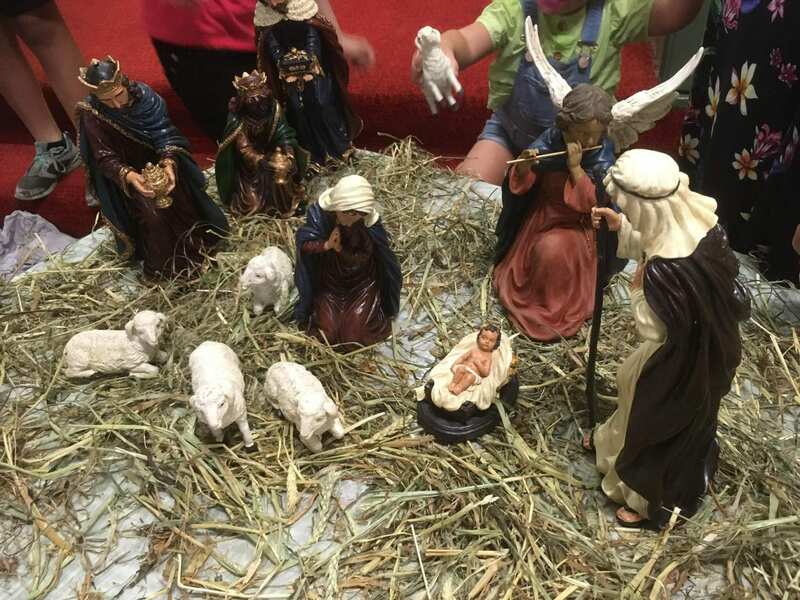 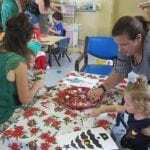 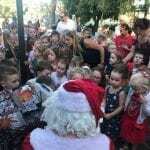 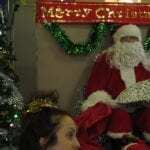 Over 200 people (including around 80 children) came along to begin their Christmas season. 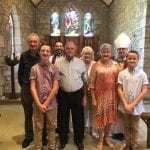 We even had three generations of a couple of families come along to celebrate the advent of Christ with us. 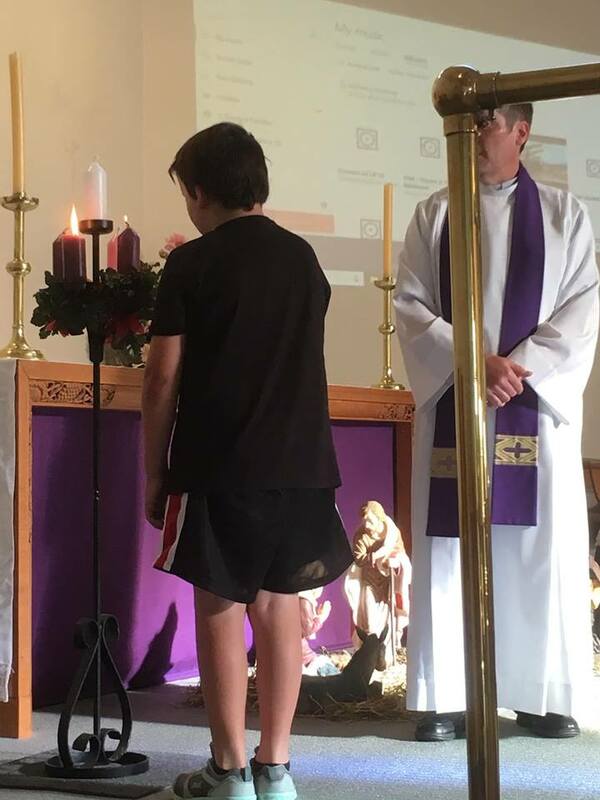 To help promote services at each parish, information about Christmas services at each parish was printed on the back of the song sheet. 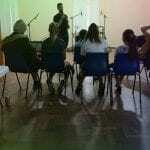 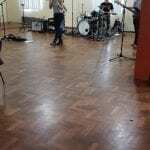 Feedback from those who attended was unanimously positive, with many expressing gratitude for us having put the night on. 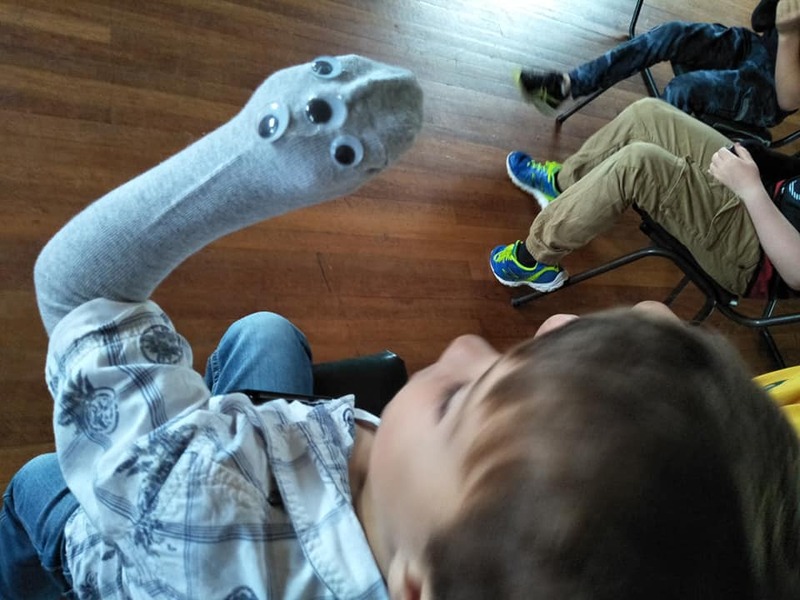 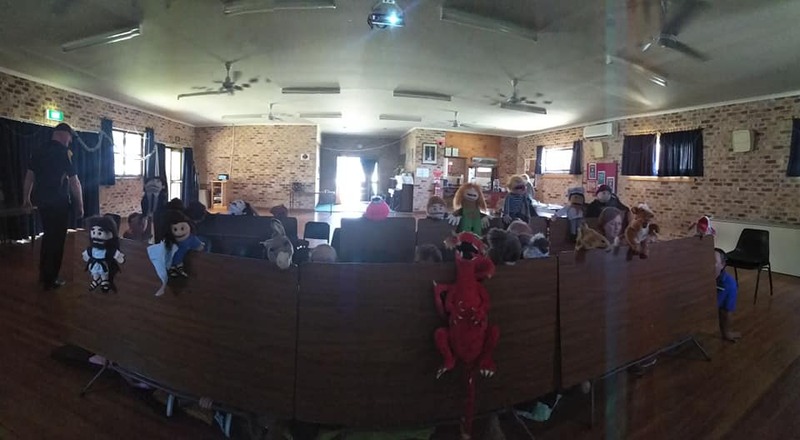 It has been a fun-filled term at Gloucester Kids Church learning how to use the puppets. 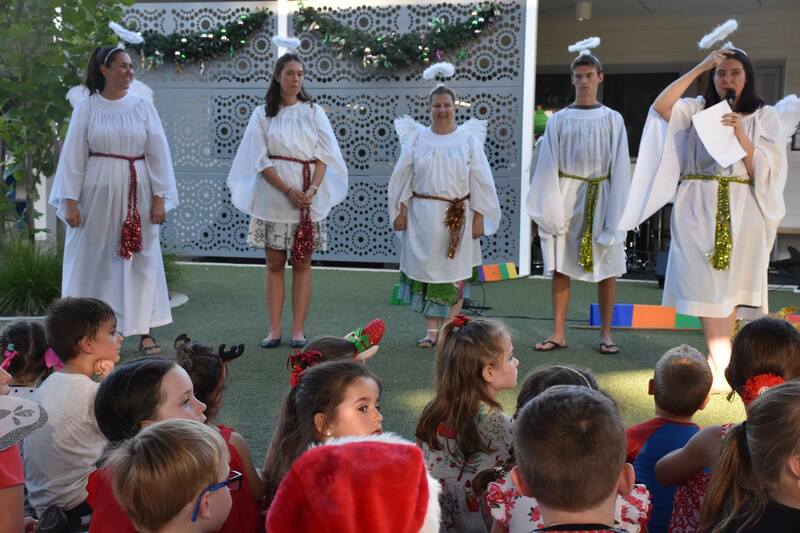 The kids (and adults) are almost ready for our Christmas Eve service. 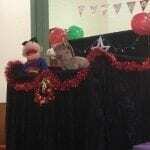 All we need now is a gigantic puppet theatre which is kindly being built by Paul to get this show on the road. 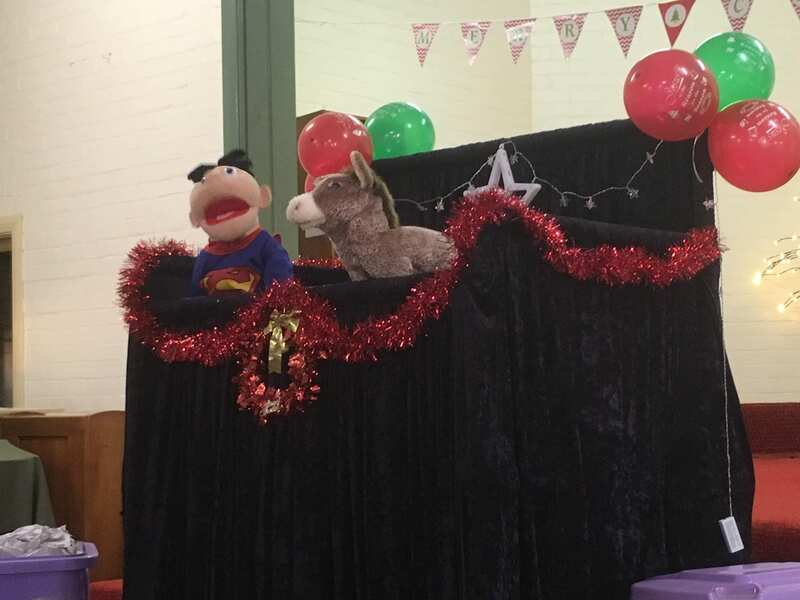 Guests will be treated to Bohemian Rhapsody with a twist of Jesus. 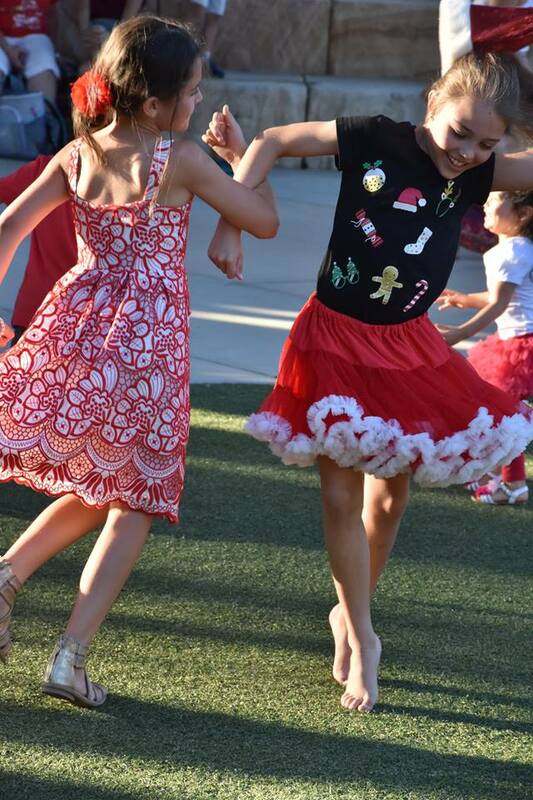 So much fun rehearsing our Christmas Eve item! 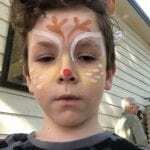 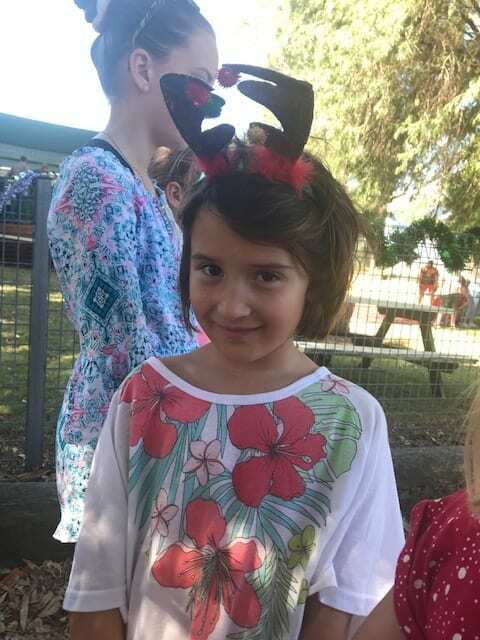 The Christmas pics are starting! 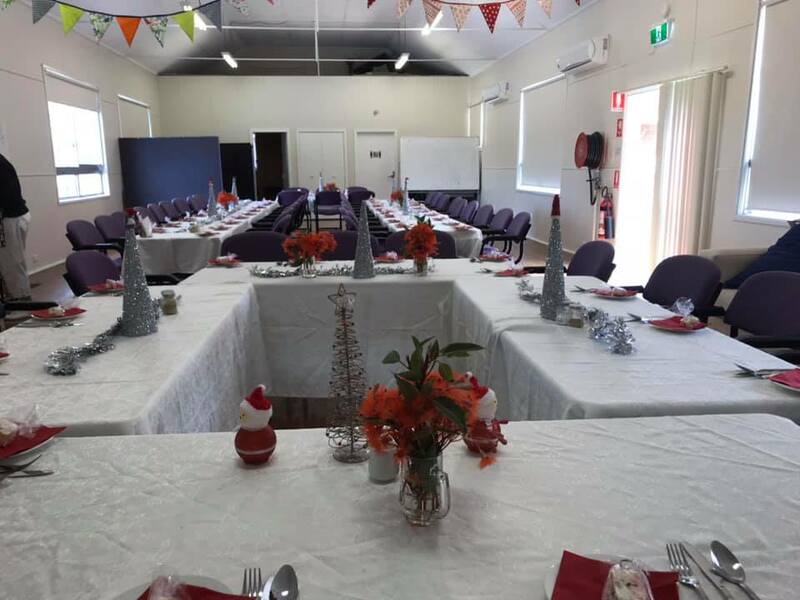 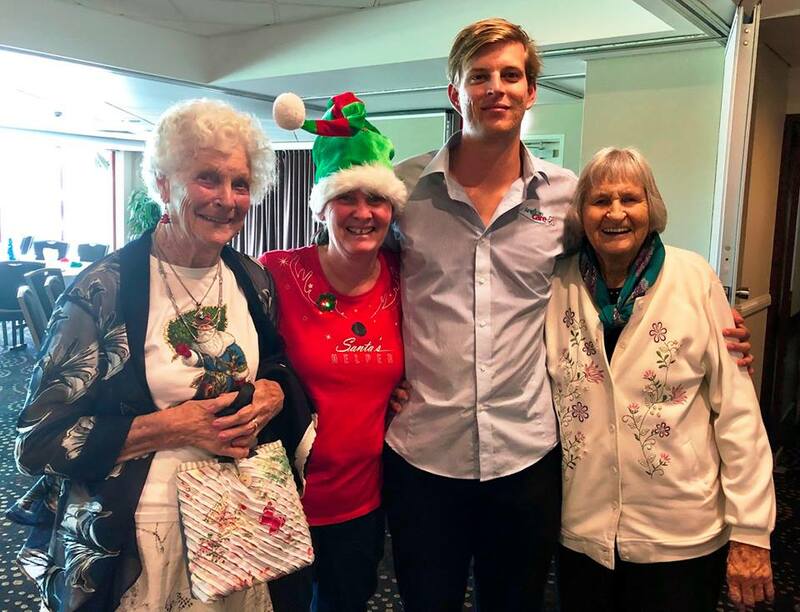 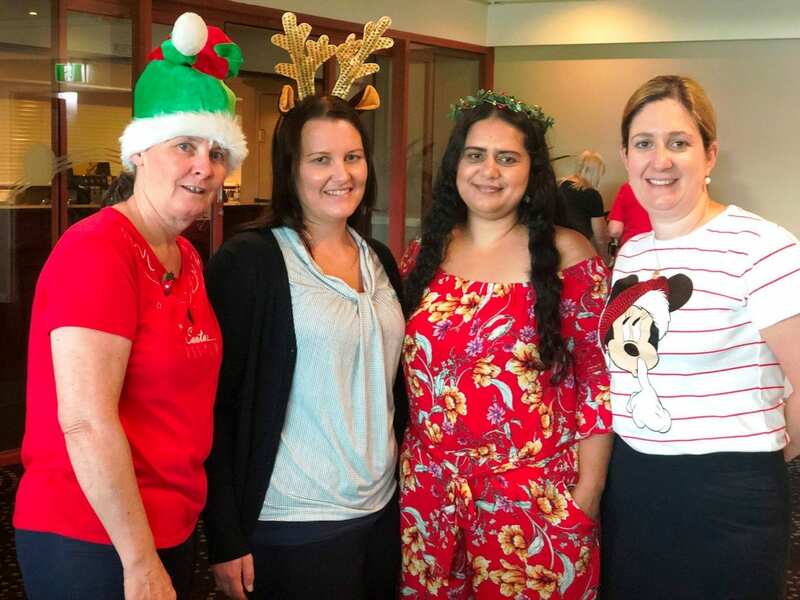 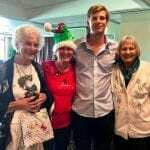 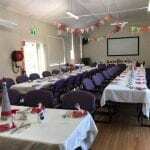 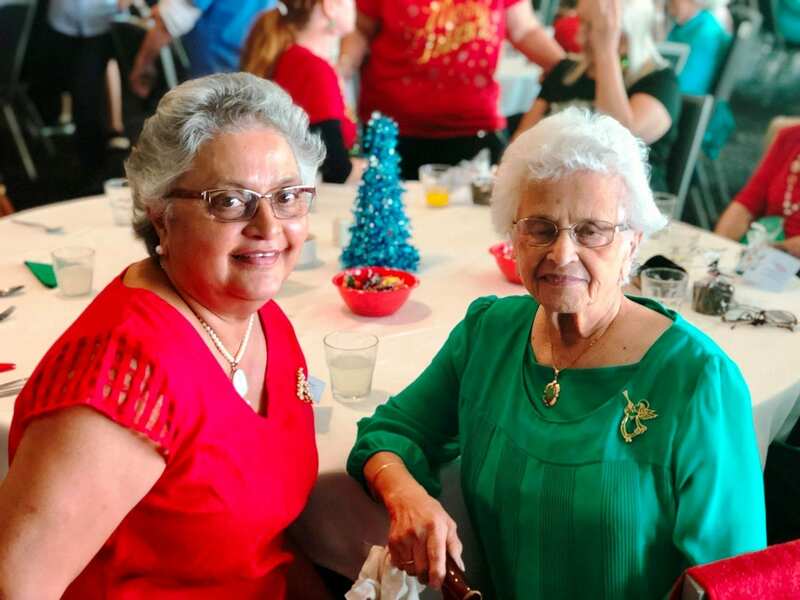 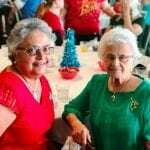 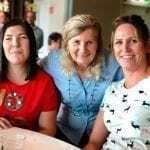 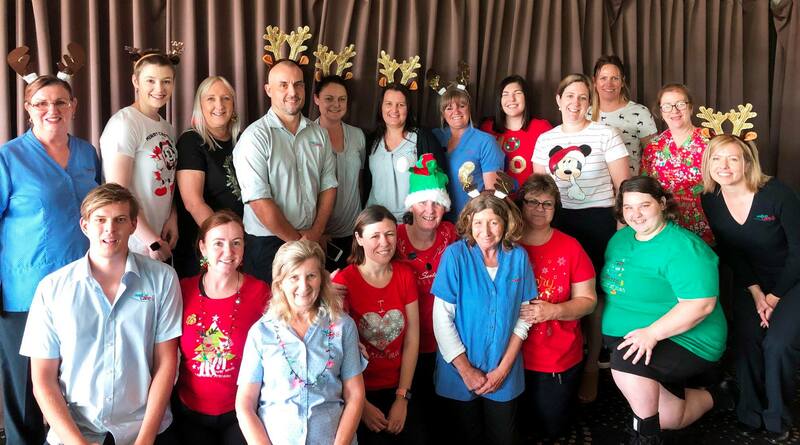 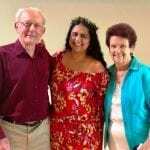 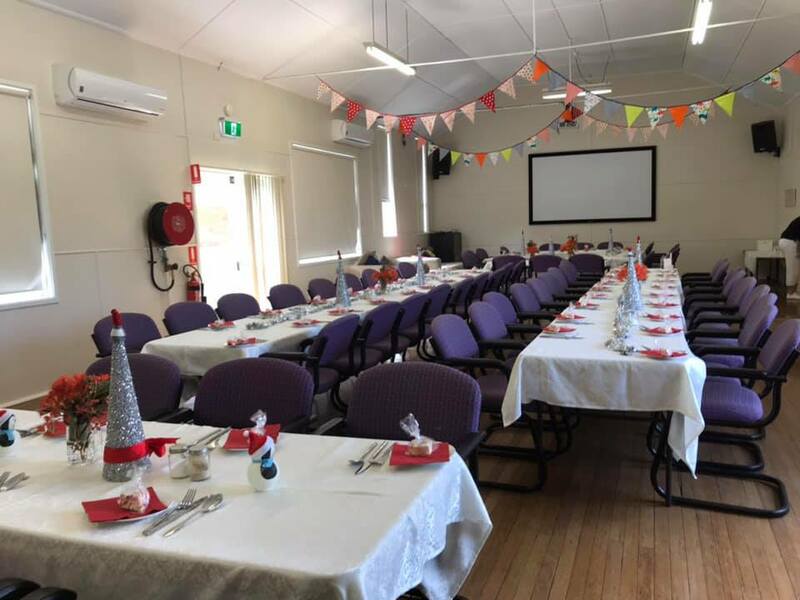 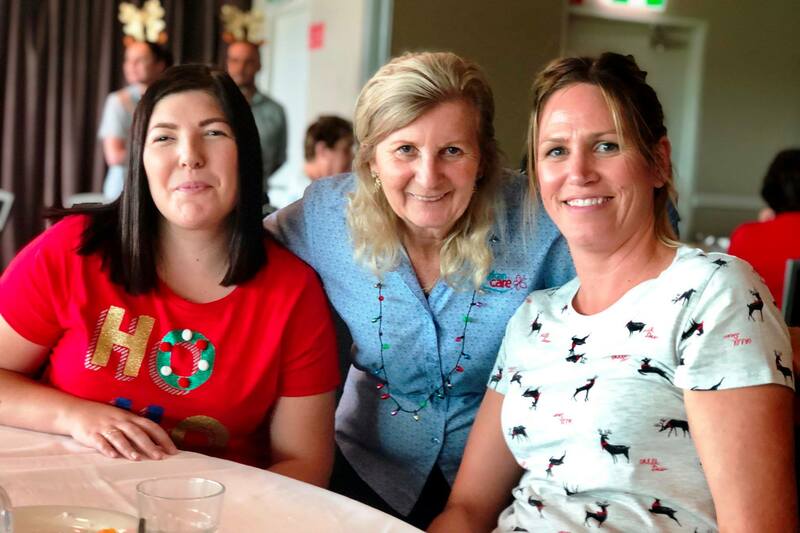 A fantastic time was had by all who attended Anglican Care’s Home Care Xmas Party at Club Macquarie! 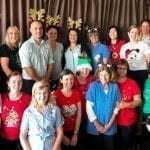 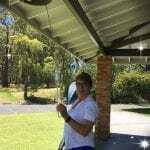 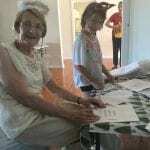 Open Door Cafe at Nelson Bay is officially over for another year. 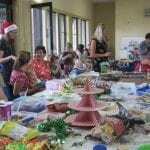 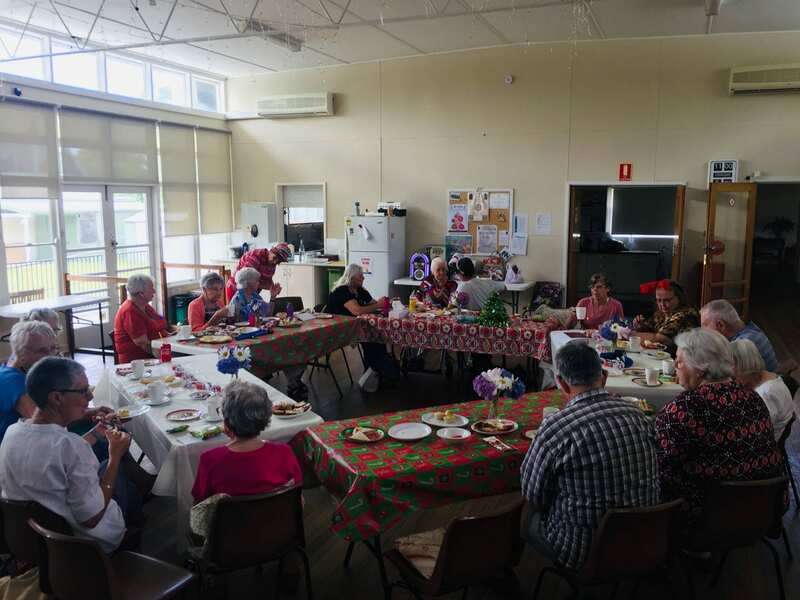 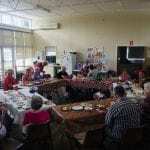 46 people came and enjoyed a traditional Christmas lunch. 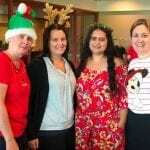 Have a safe and blessed Christmas from your ODC team. 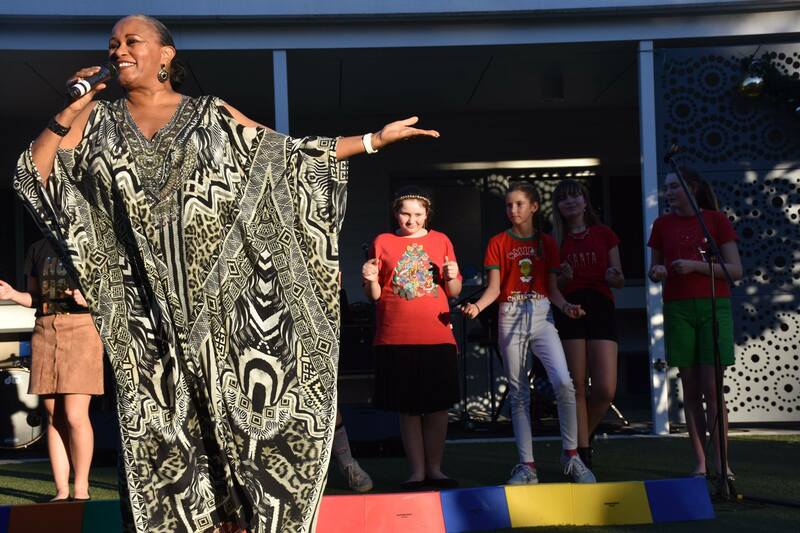 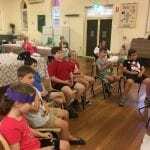 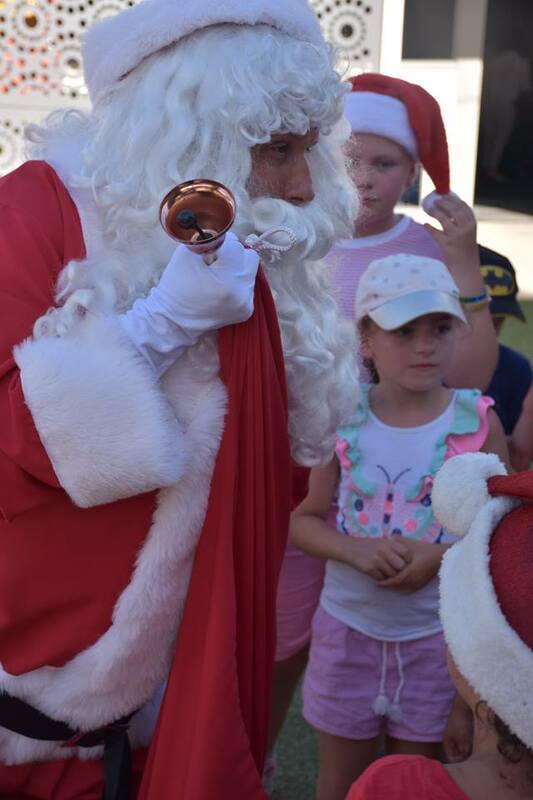 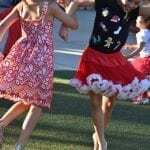 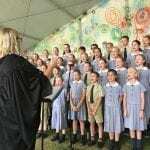 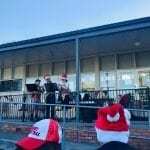 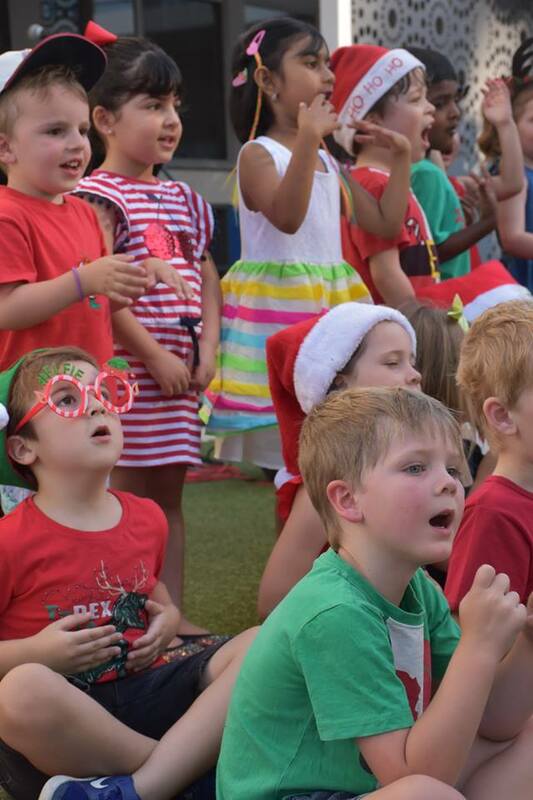 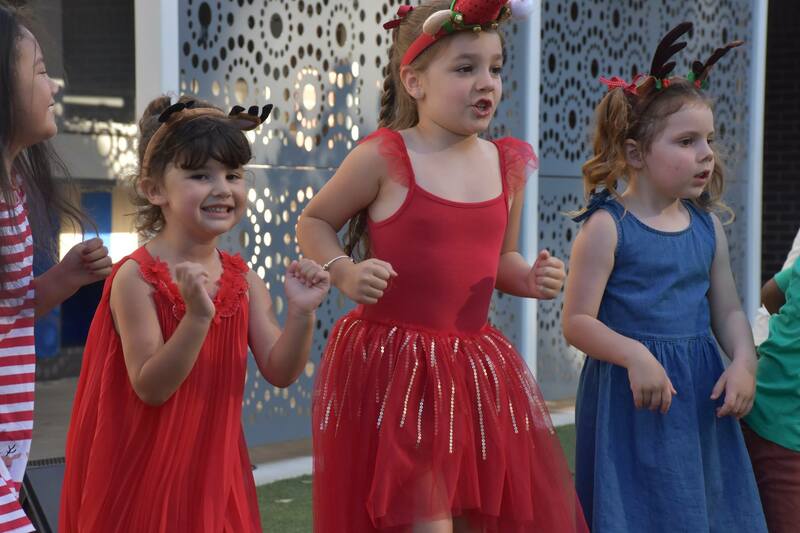 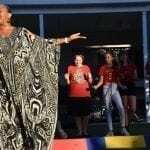 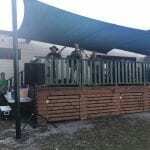 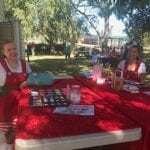 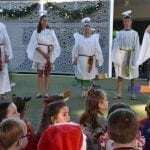 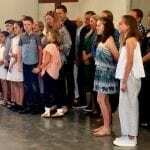 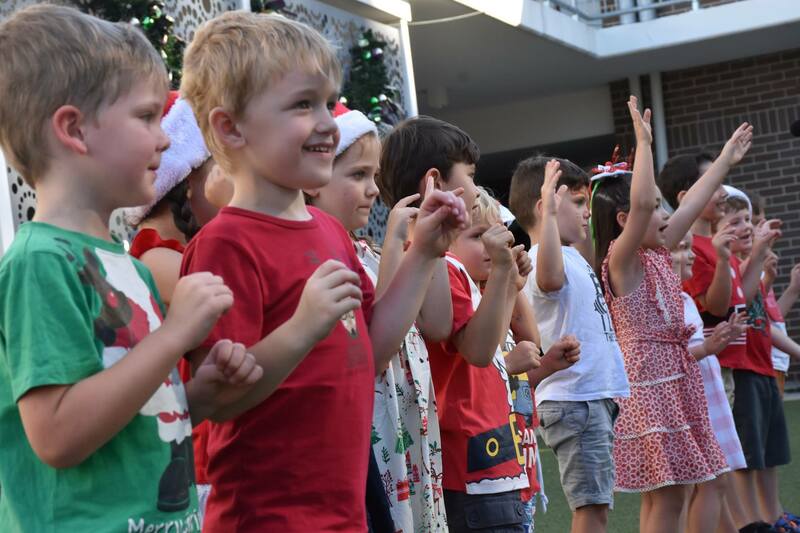 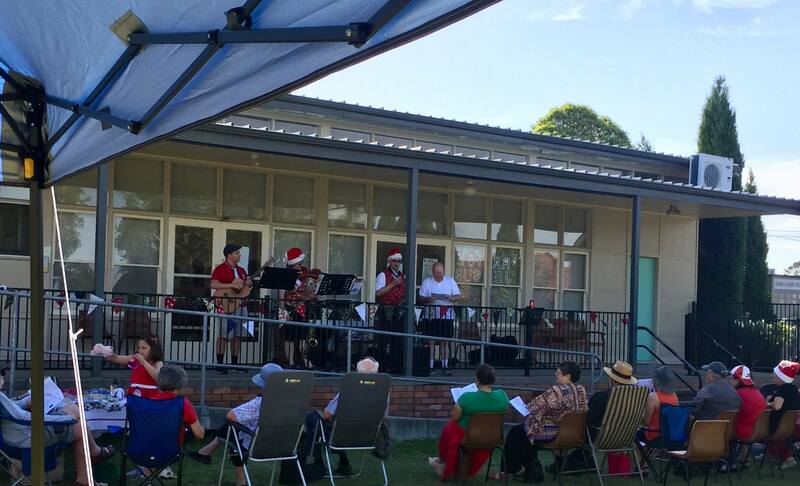 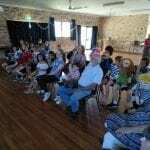 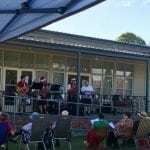 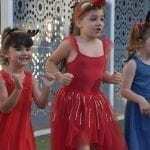 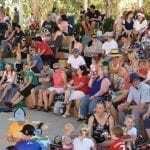 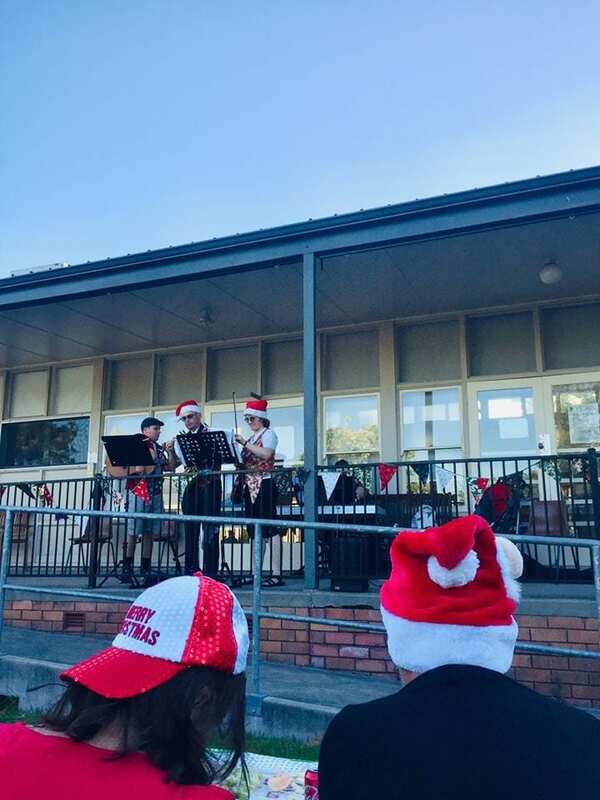 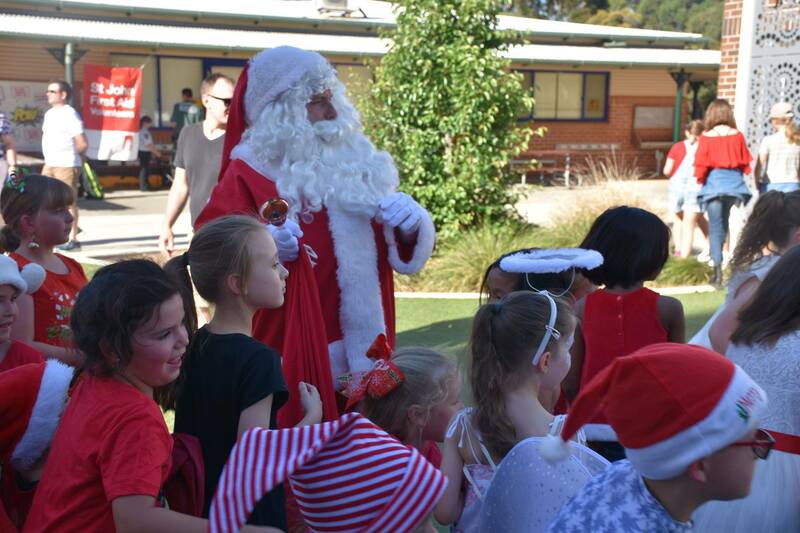 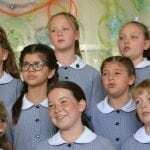 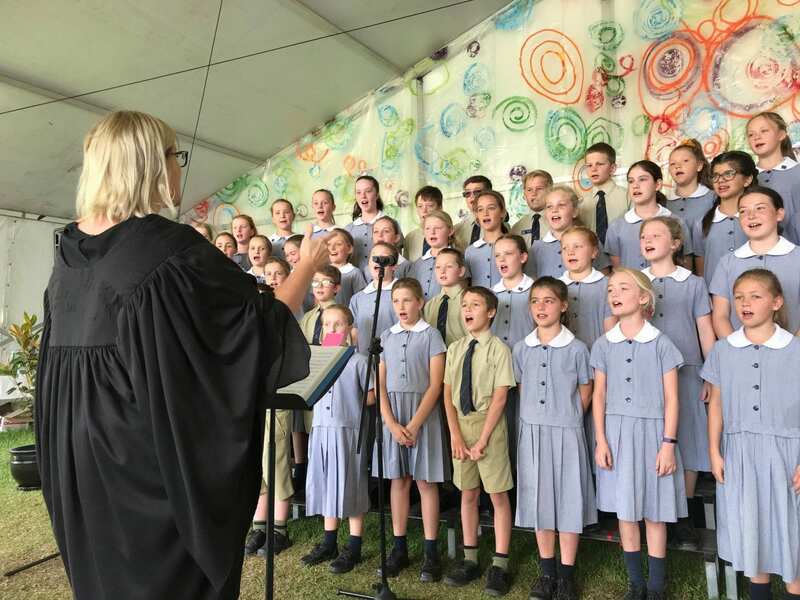 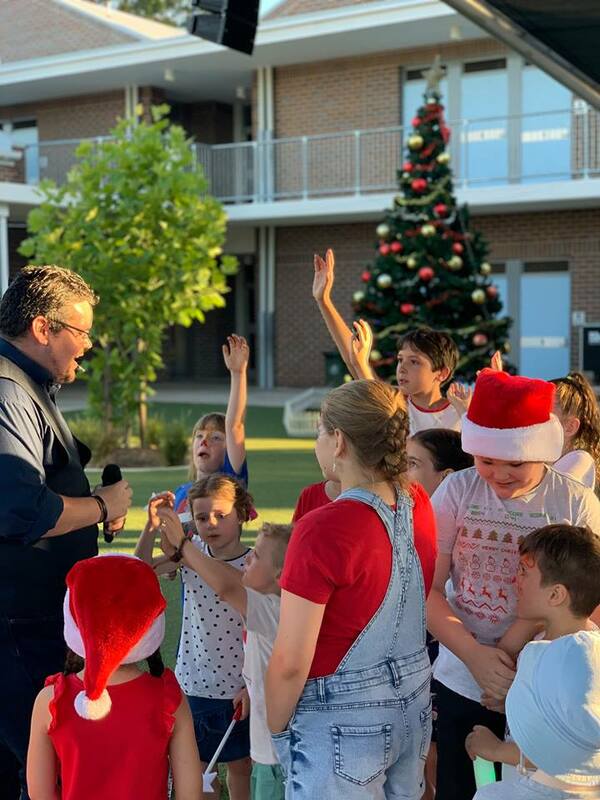 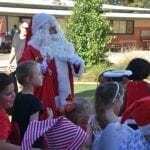 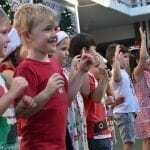 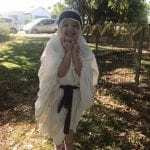 Bishop Tyrrell Anglican College had a great afternoon of singing and dancing at their recent Community Christmas Carols. 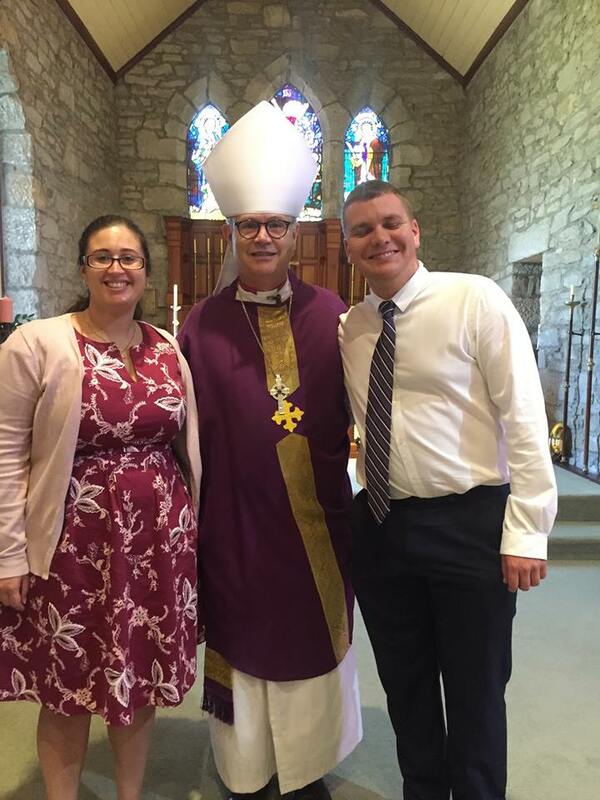 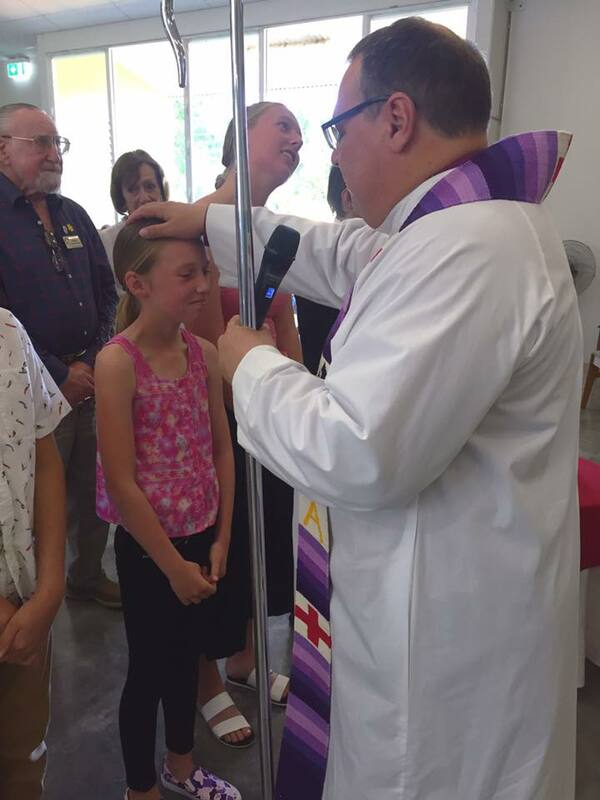 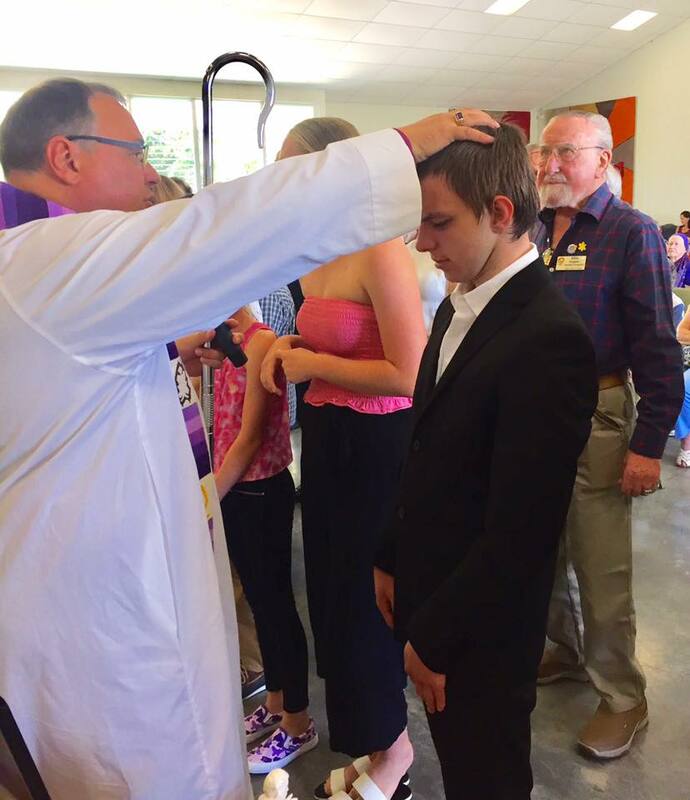 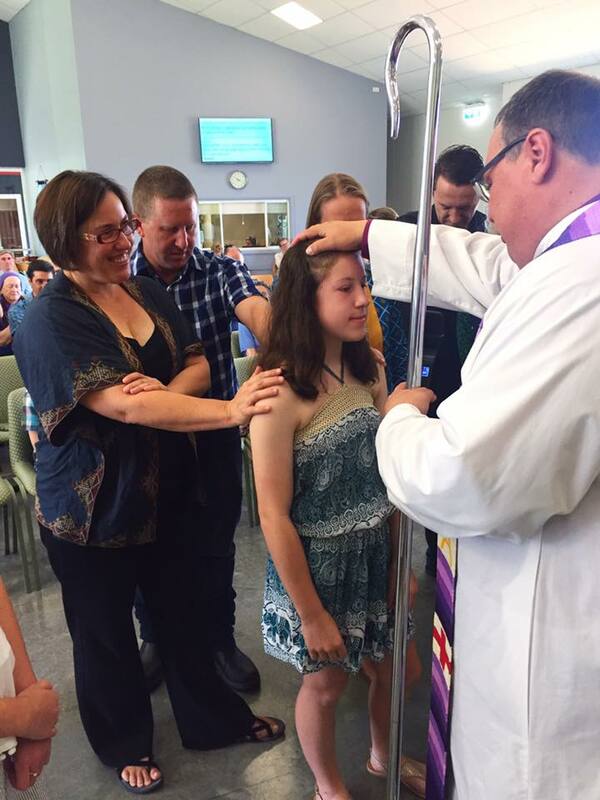 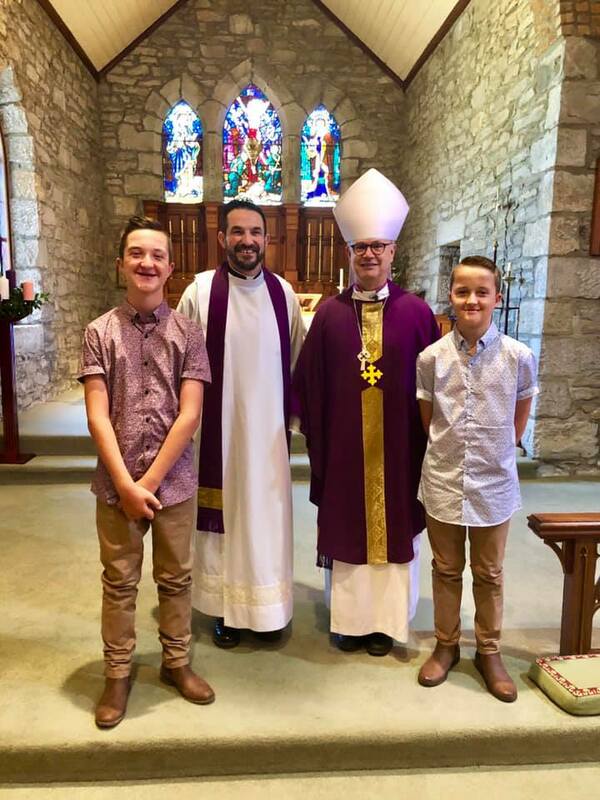 Bishop Charlie visited Lakes Anglican this week for 11 Confirmation – blessings to these amazing young people as they journey with Christ. 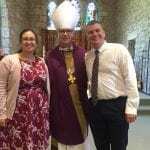 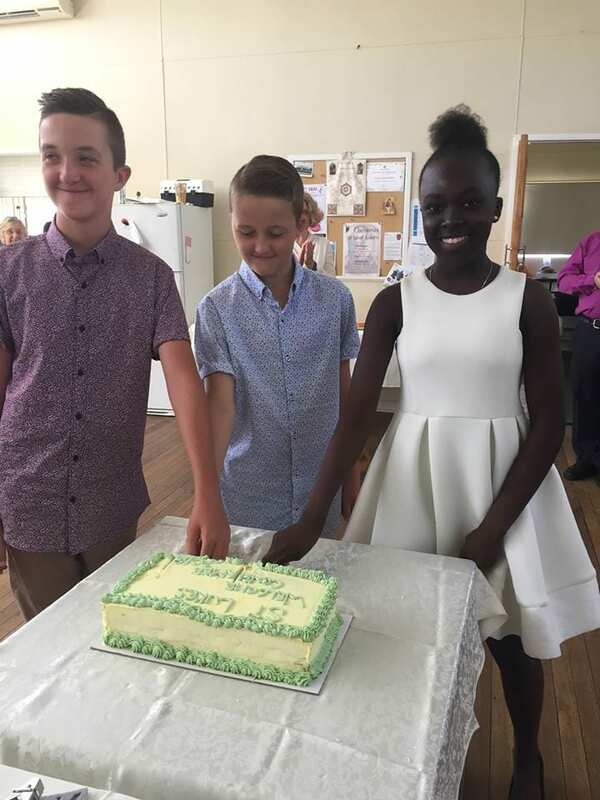 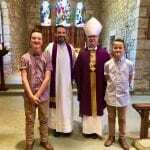 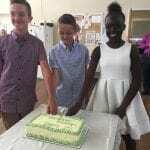 Congratulations to Lulu, Blake and Jed who were confirmed by Bishop Peter at St Luke’s Wallsend, and Simon and Katrina who were received into the Anglican Communion. 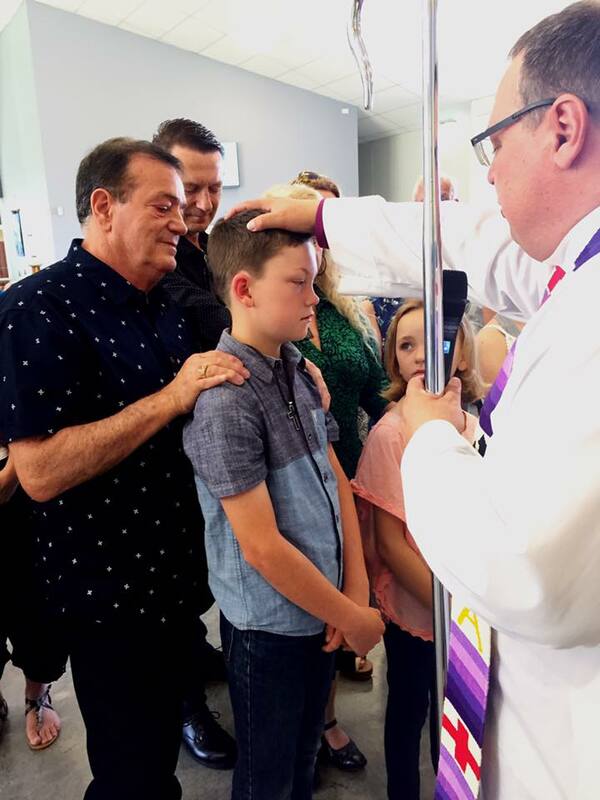 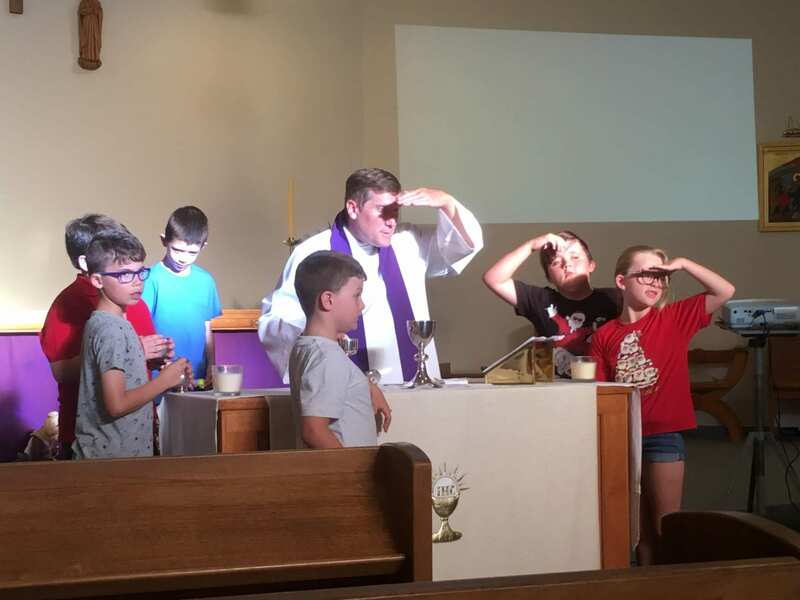 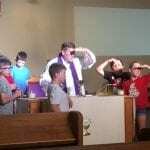 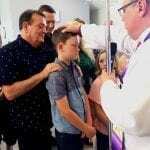 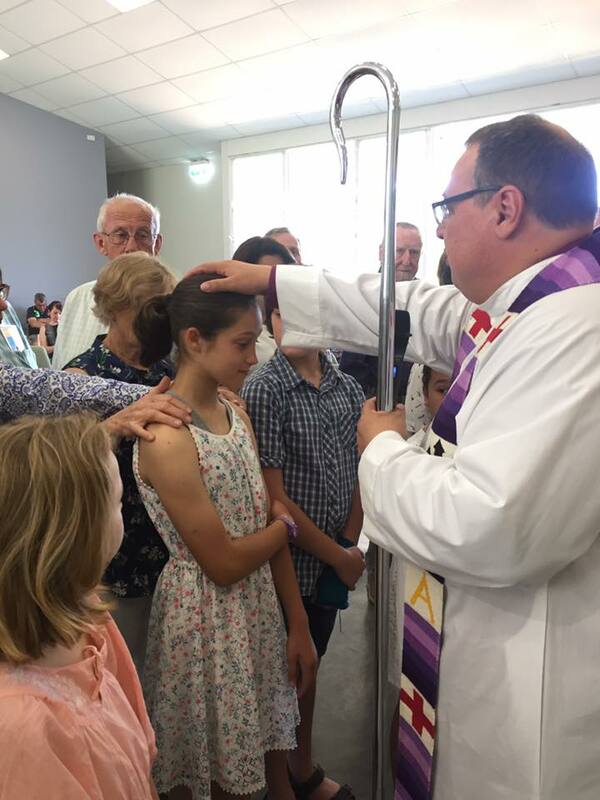 People growing into and living out their faith at Saint Luke’s. 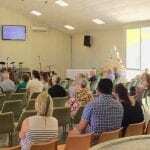 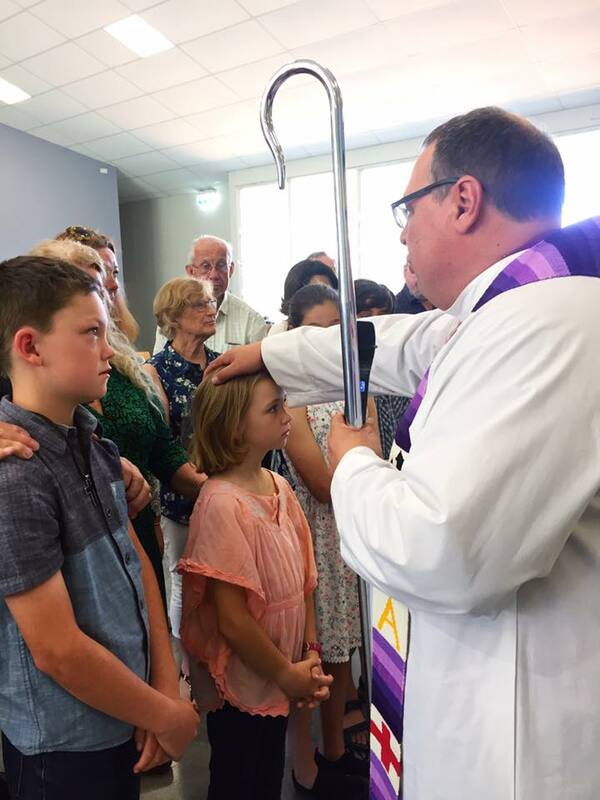 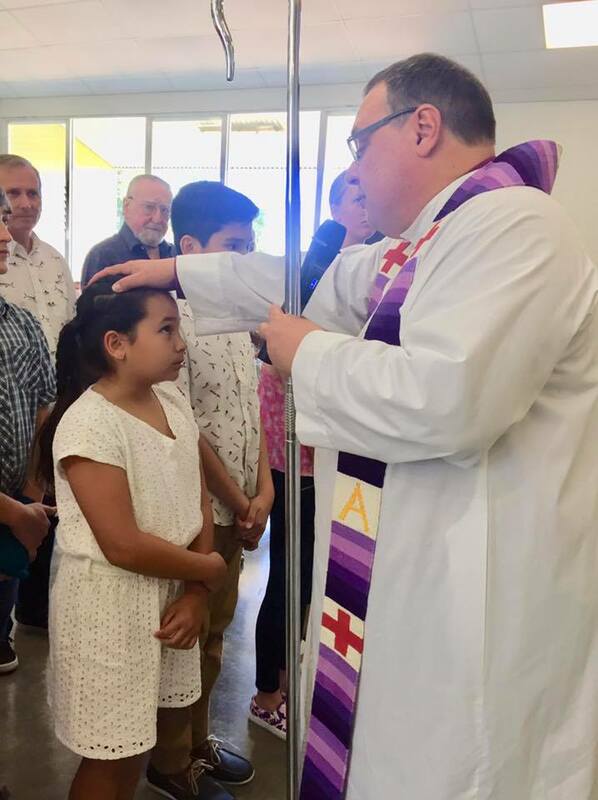 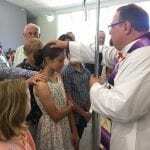 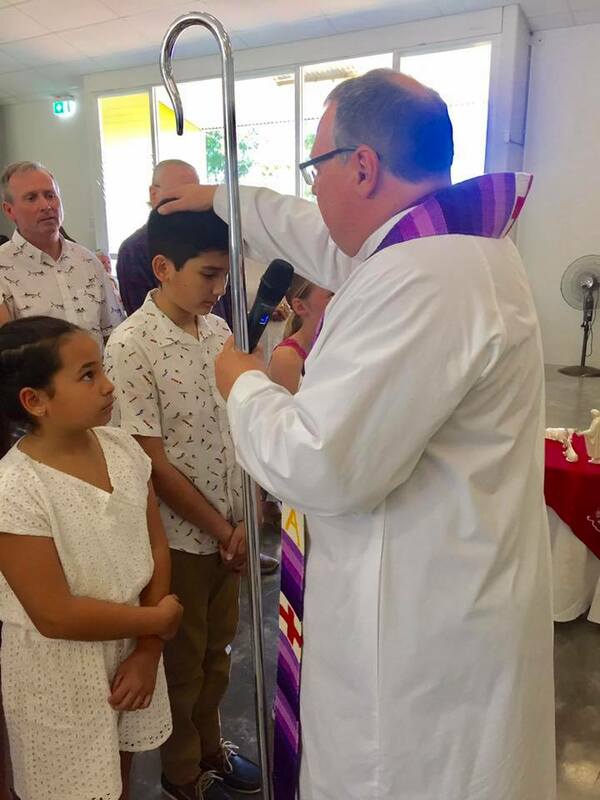 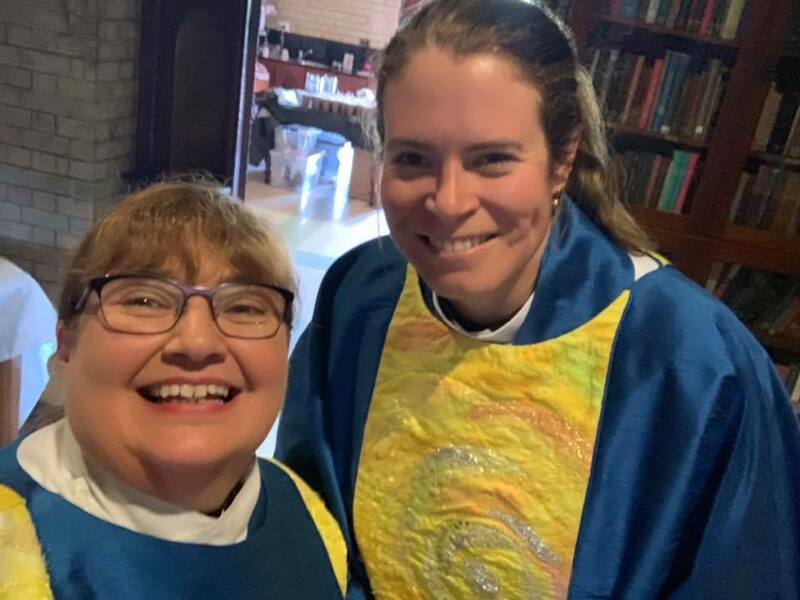 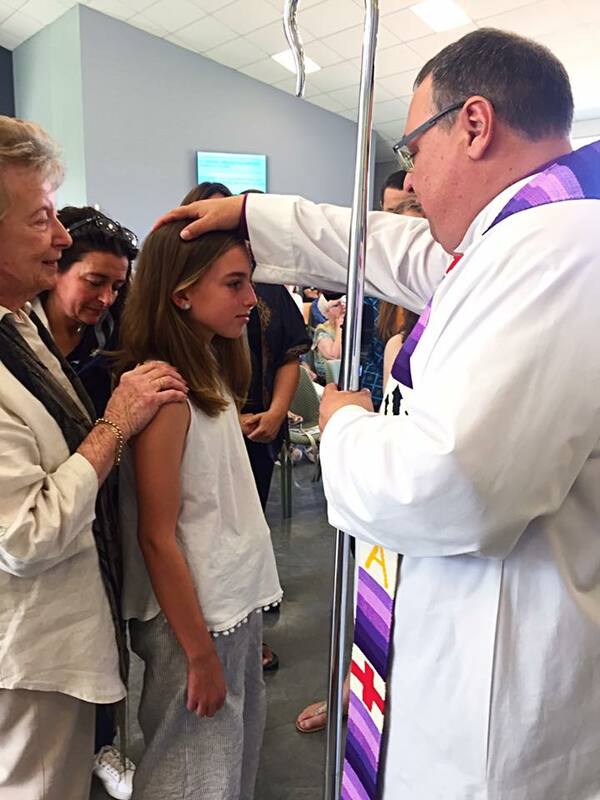 Over 100 people came together on the weekend of November 24-25 for the Service of Deconsecration of St John’s Point Clare. 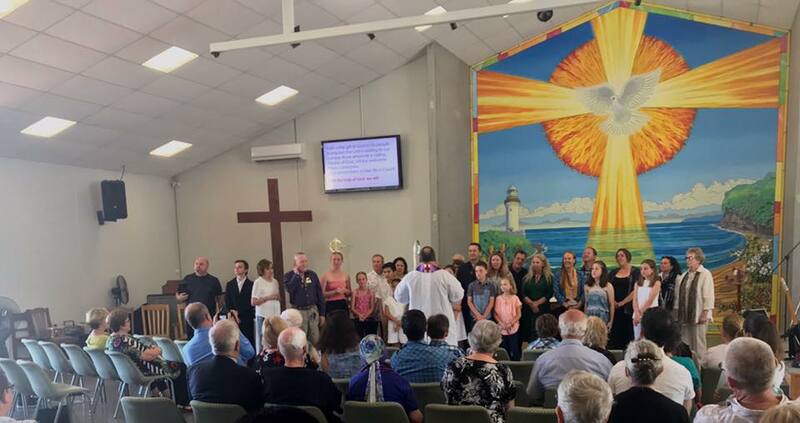 Current and past parishioners, as well as representatives from the German Lutheran and Coptic Churches. 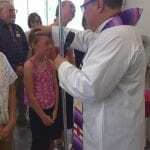 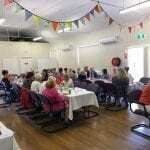 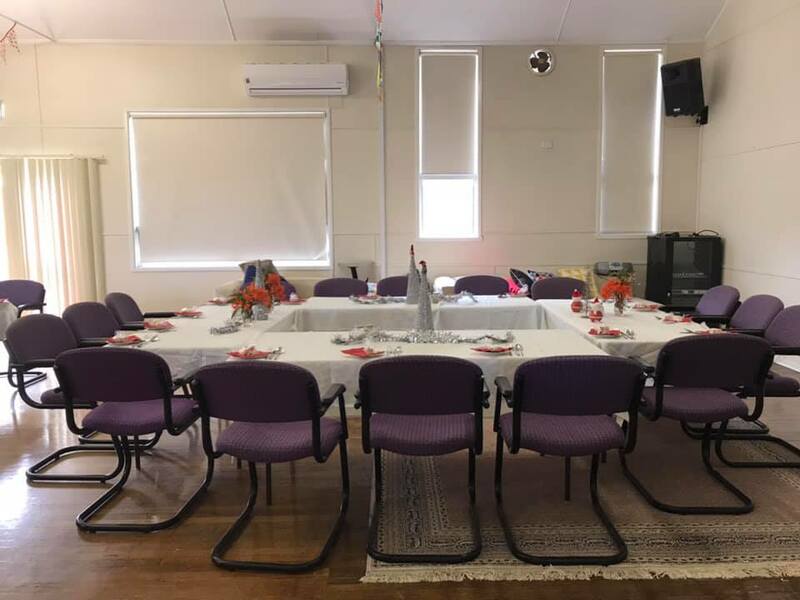 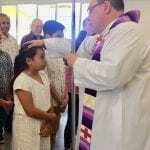 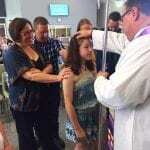 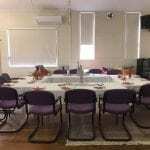 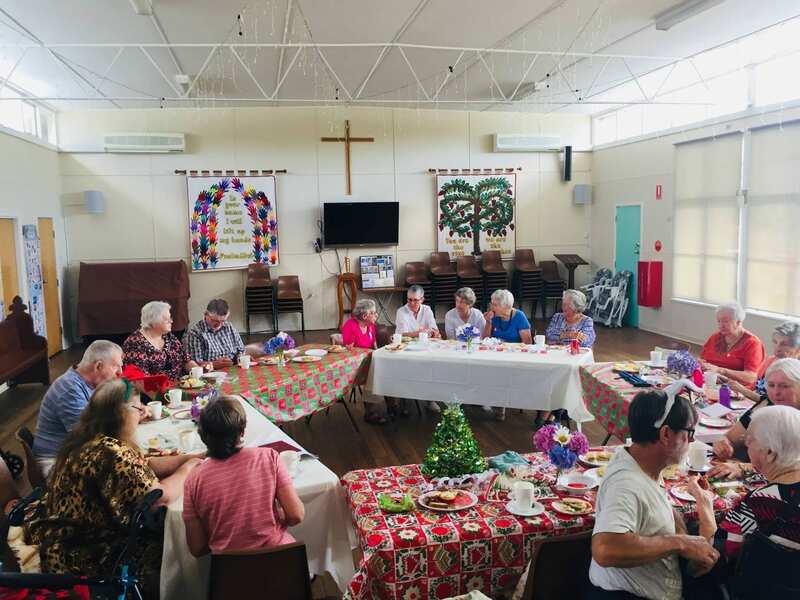 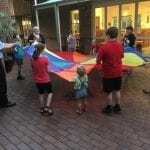 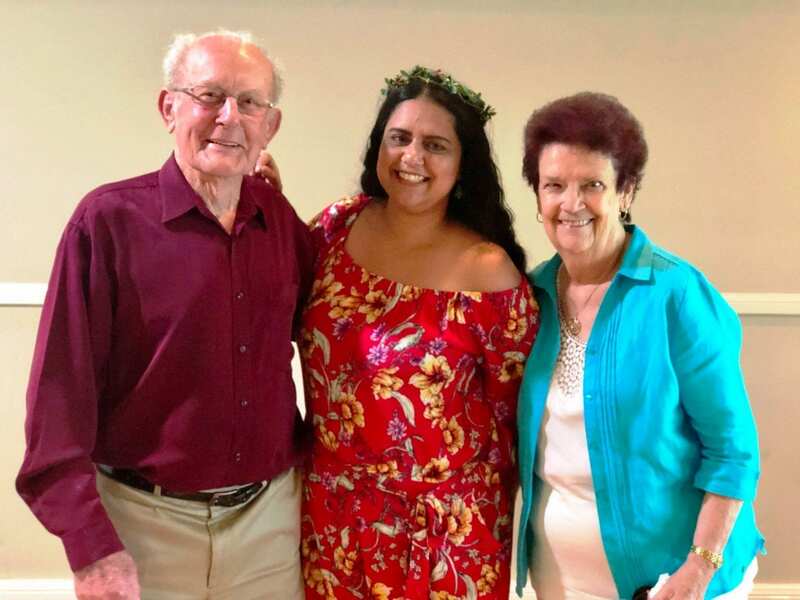 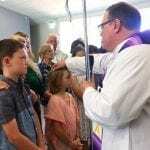 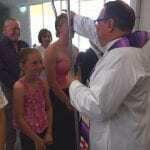 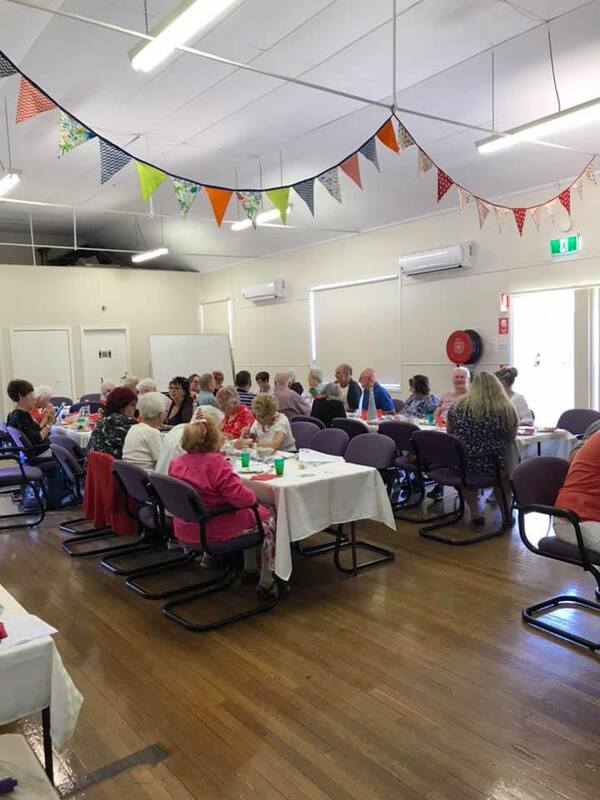 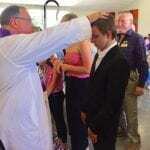 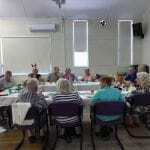 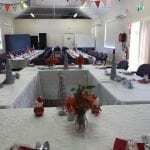 On Saturday, 24th they had a farewell luncheon attended by 50 parishioners as well as Fathers Rod Bower and Jim Innes. 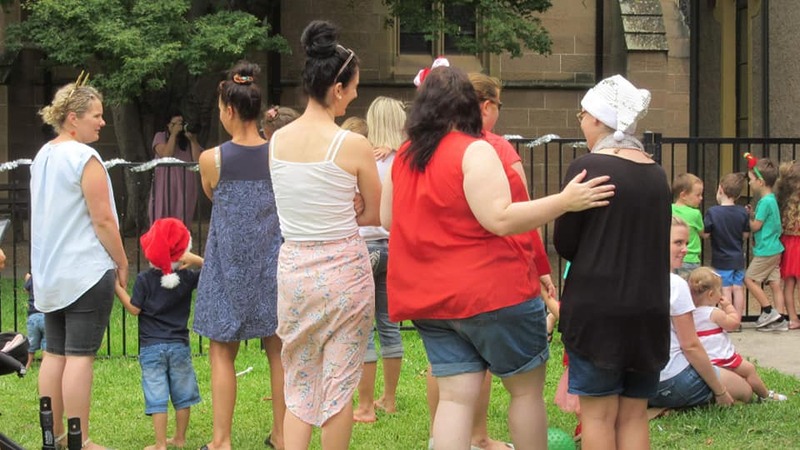 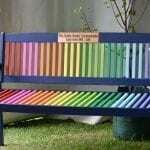 Thankfully there was much laughter as well as sadness. 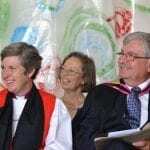 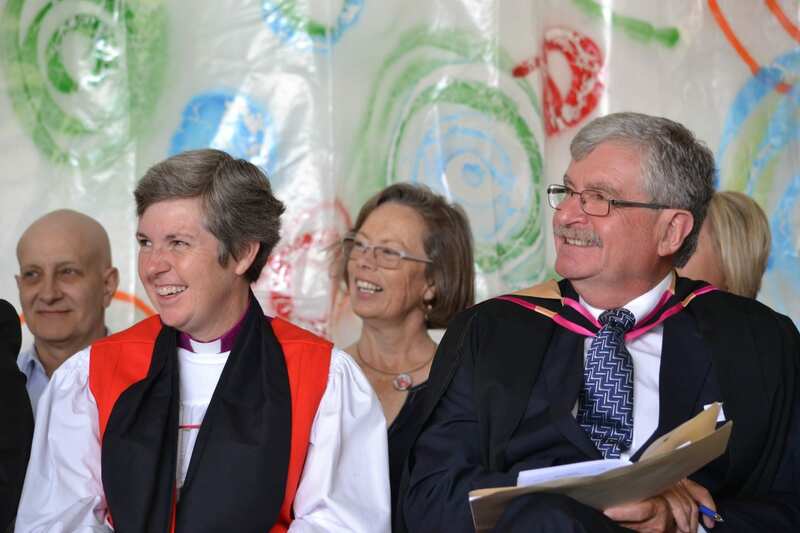 Reverend Valarie McDonald presented awards for some personal outstanding qualities she saw in each of those attending, bringing much frivolity. 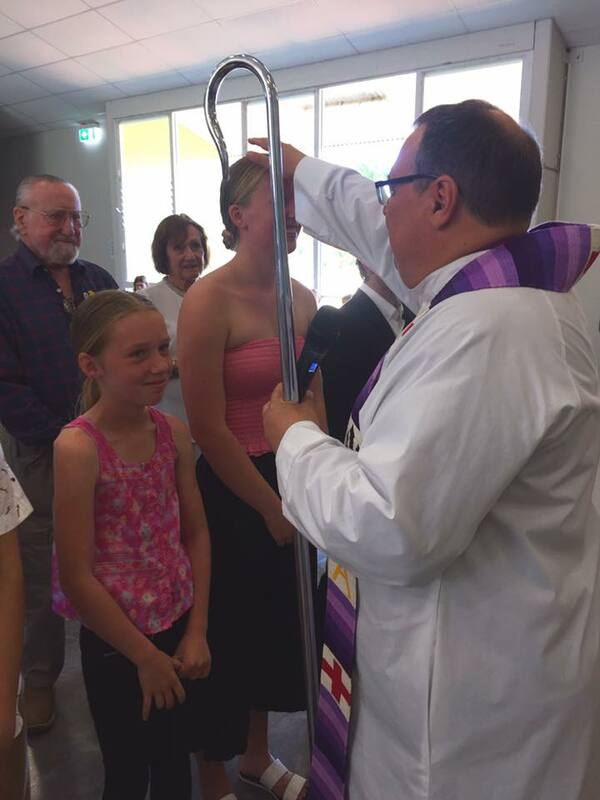 The congregation presented Reverend Val with a beautiful potted rose. 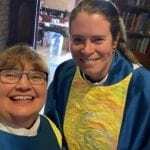 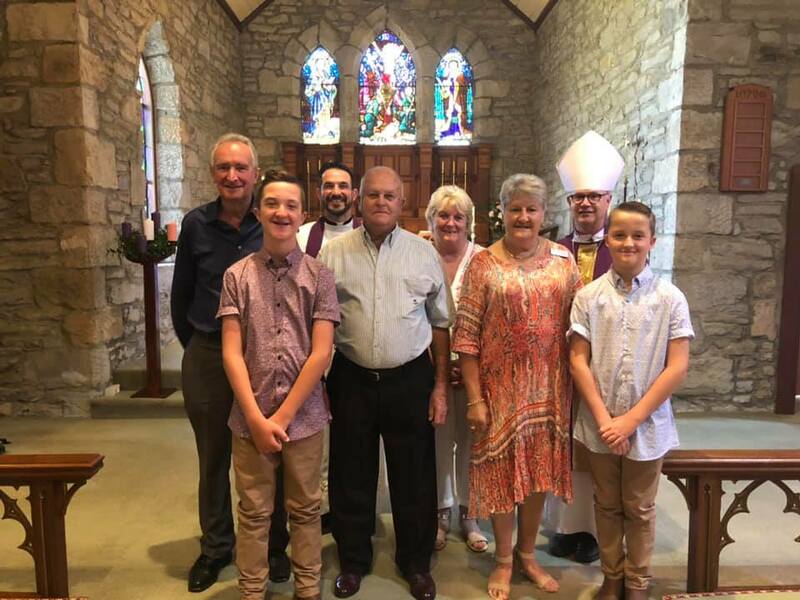 The Service of De-consecration of St John’s Church on Sunday 25th was led by Bishop Charlie Murry and the congregation was grateful for his empathy and compassion for us at this time. 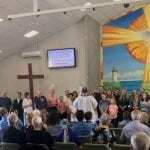 It was pleasing to have parishioners from Christ Church Gosford and the Mountain Anglicans showing their support by attending this final service. 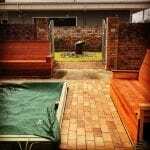 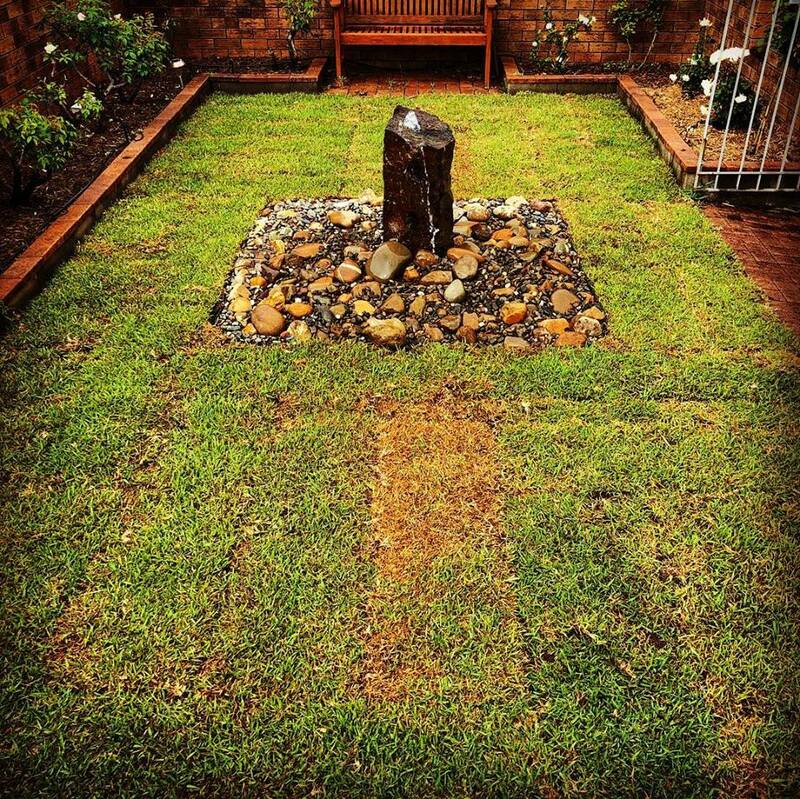 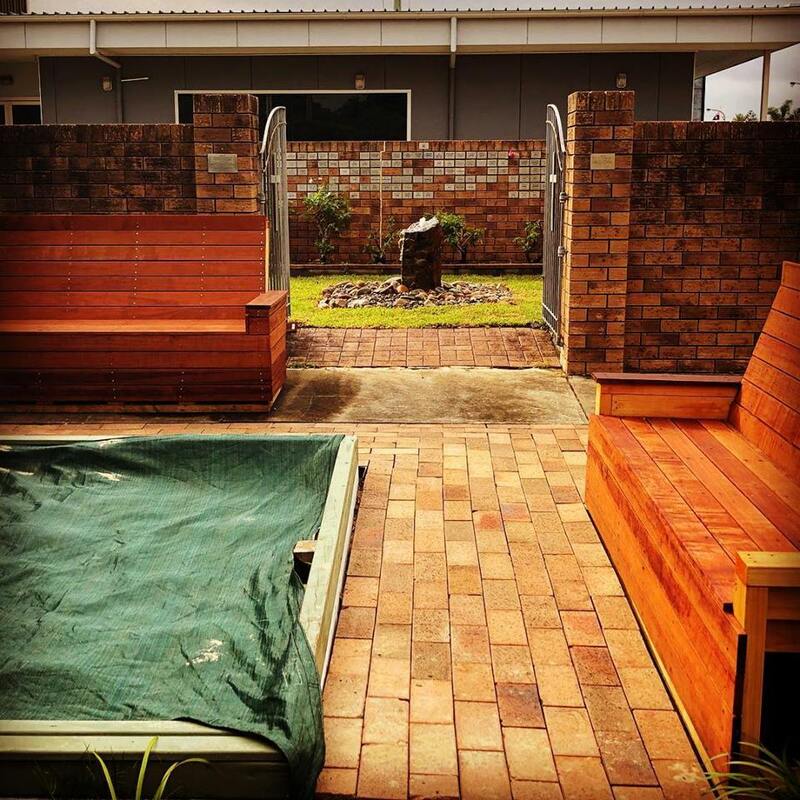 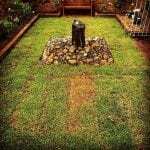 The Parish of Merewether shared these photos of the progress of new landscaping around the memorial garden. 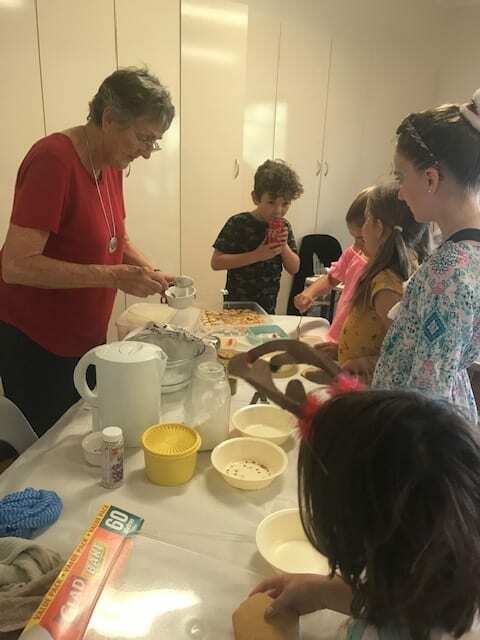 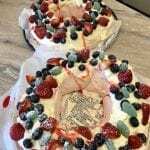 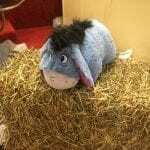 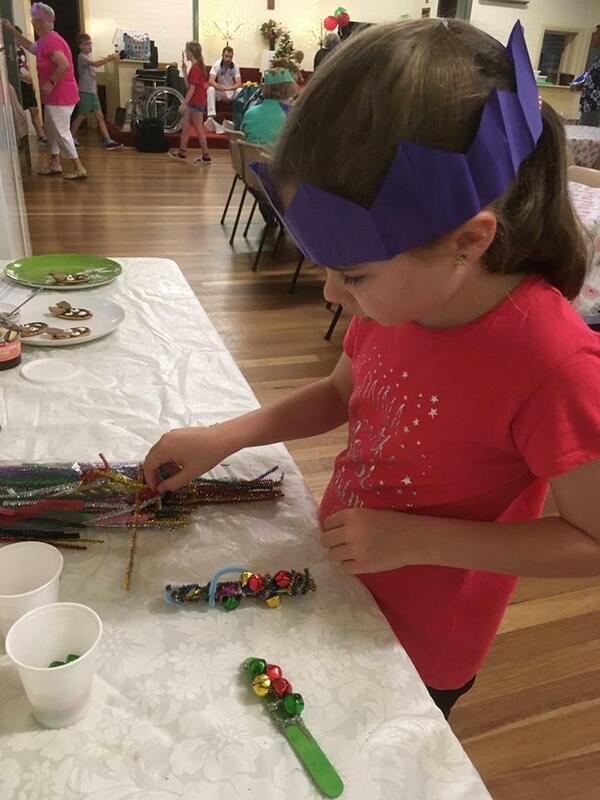 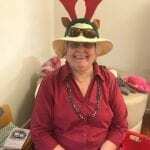 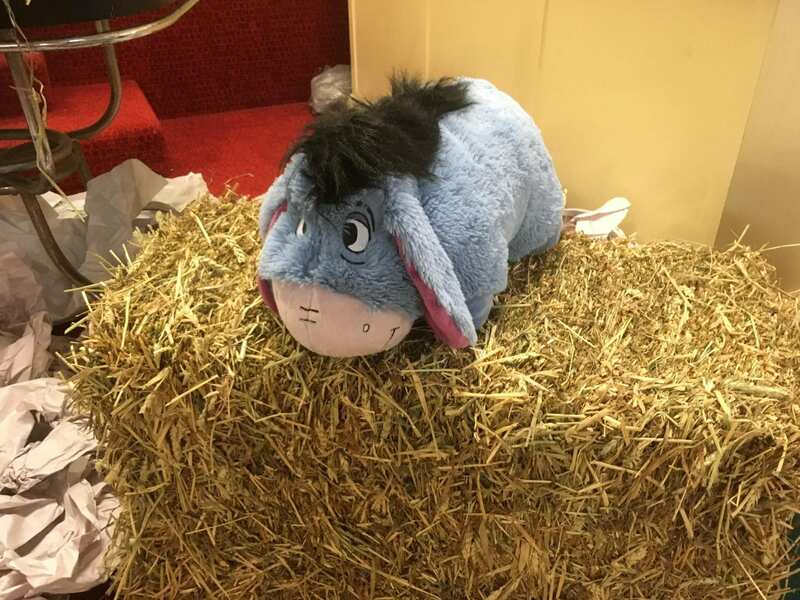 December 5 saw the last Singleton Parish Drop In Group (DIG) meeting for 2018, so as well as the usual fun and creative activities inside and outside, there was a party (with a special visitor) in the Parish Hall. 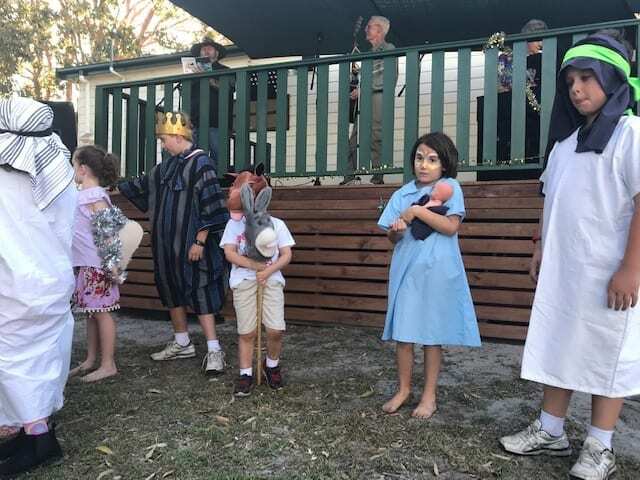 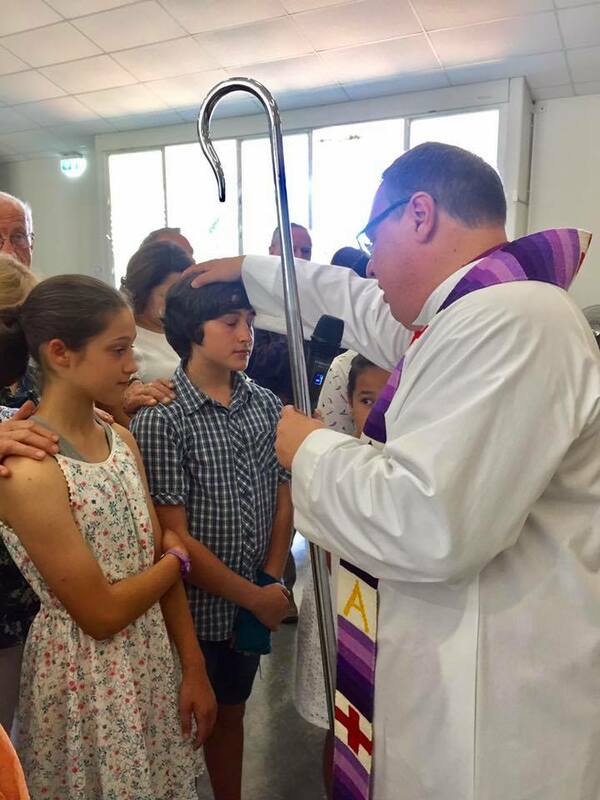 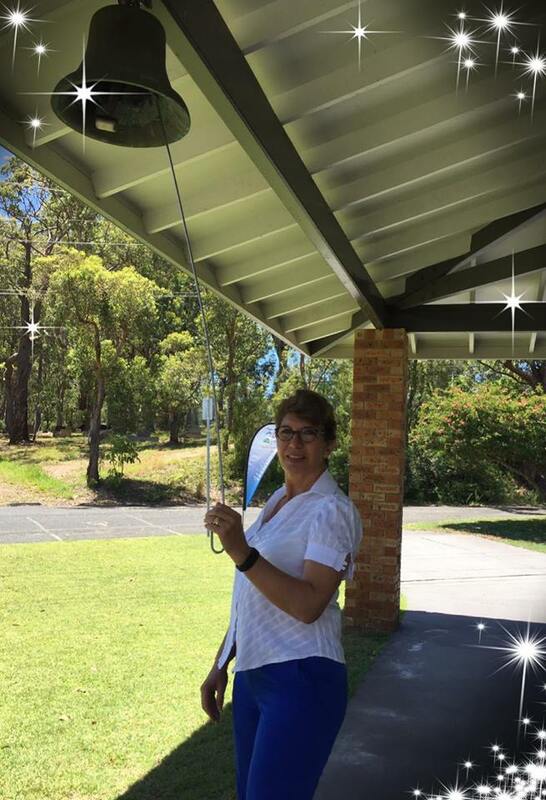 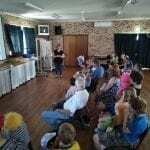 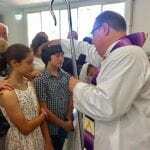 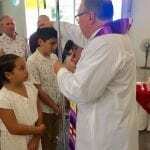 Forster Parish once again tolled their #refugeebell to advocate for the freedom of children on Nauru. 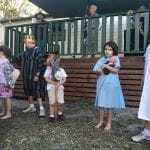 As of last Friday there were still 10 children left on Nauru. 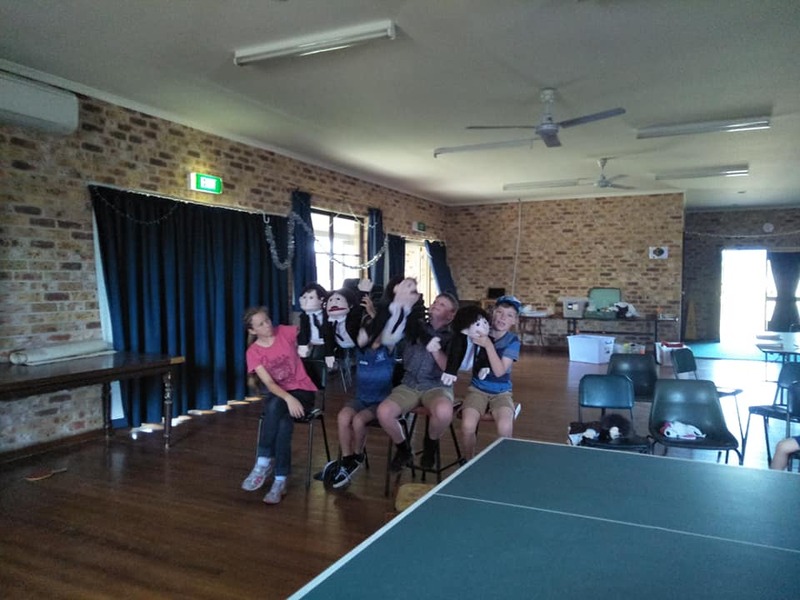 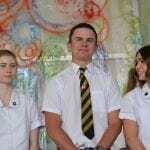 High schoolers came together at Cooks Hill church on December 7 to see Amber Lights perform. 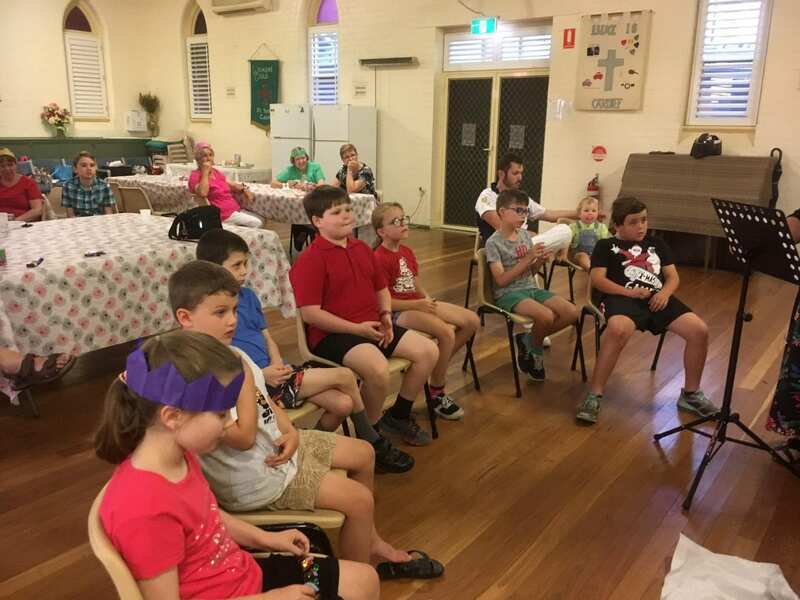 Sam from Amber Lights shared how Christ has changed his life. 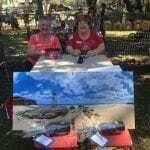 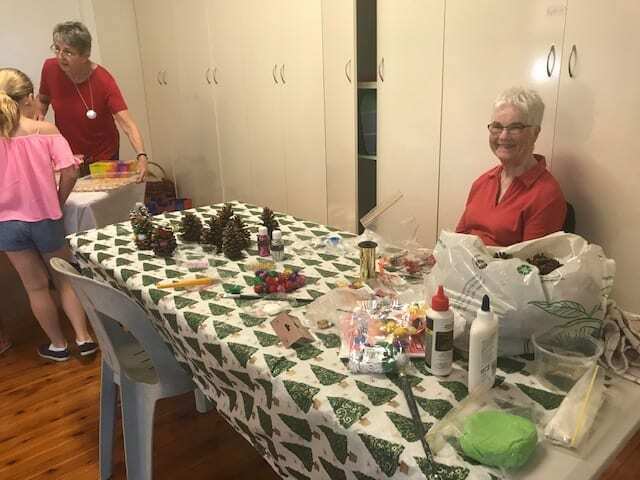 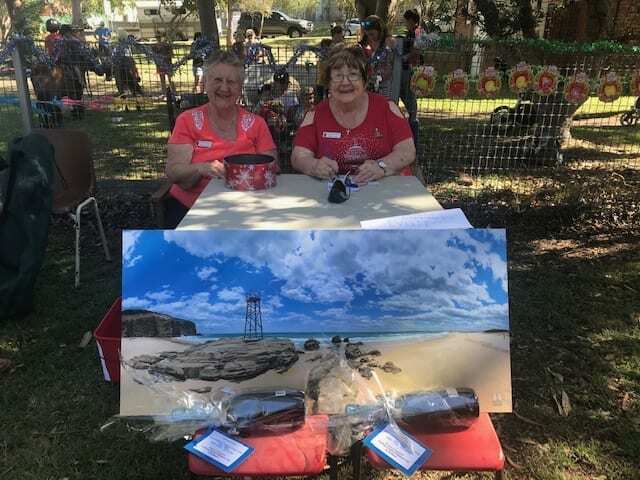 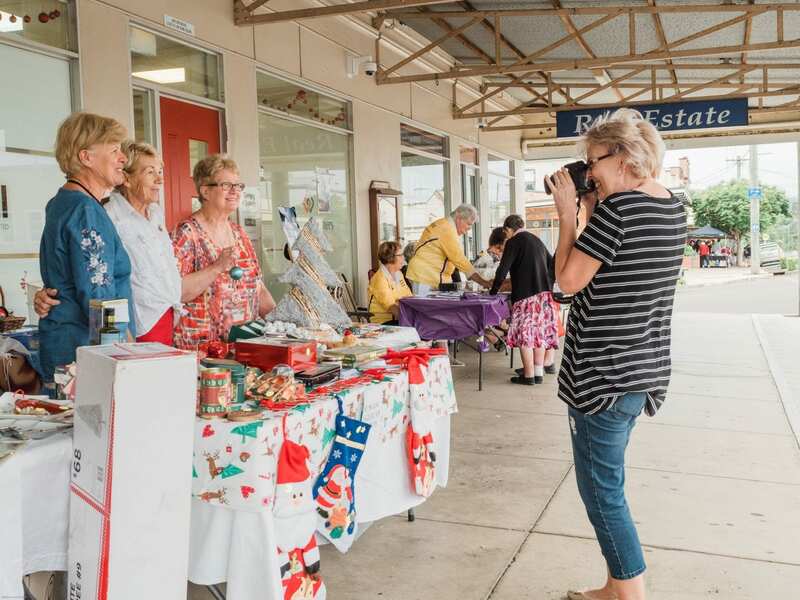 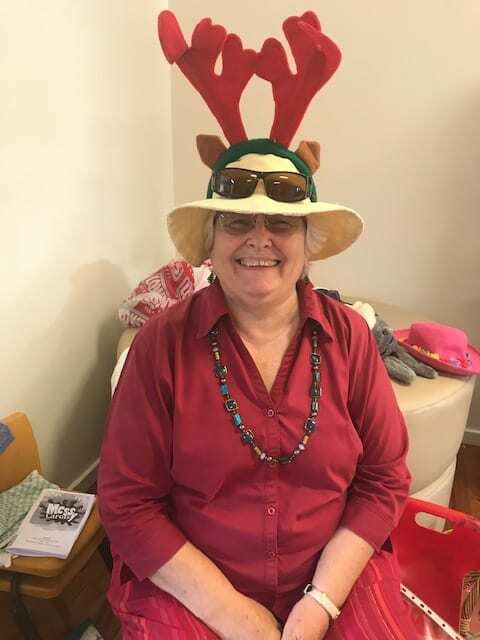 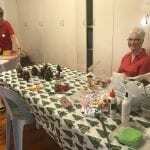 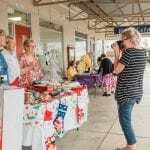 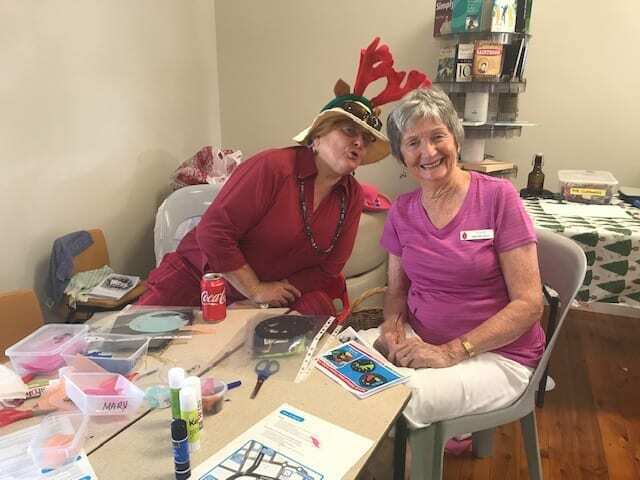 Dungog volunteers are having their photo taken at the OpShop’s Christmas Stall at the Dowling Street Christmas Party last week, along with more helpers in the background from Cuppa and Chat. 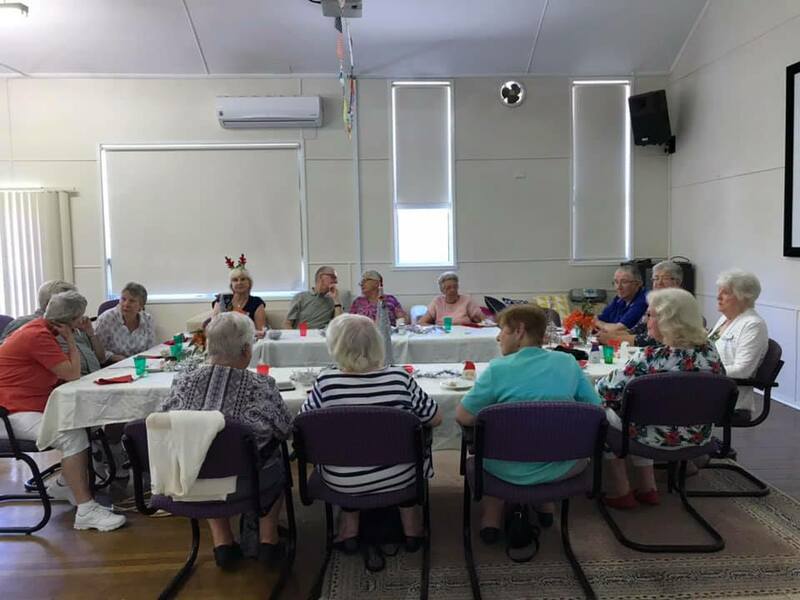 The Parish of Cardiff celebrated their Christmas Mass & Meal this week. 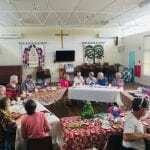 St Luke’s Wallsend came together for carols on the evening this week, plus Cuppa N Chat came together for a Christmas gathering with great food, conversations and song.